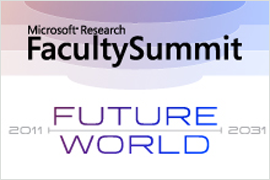 The twelfth Microsoft Research Faculty Summit provided a forum for lively debate of the development, application, and funding of technologies in the environmental, medical, and educational spheres over a long period of time. The program consisted of a variety of keynotes, talks, panels, workshops, and demonstrations. Participants came away with a much better idea of the integral part that industrial research plays in society, education, and technology transfer, and how they can contribute to this thriving community in the future. View videos of the summit presentations on the Videos tab. Student teams from six top graduate design institutions showcase their prototype interaction-design ideas in this year’s Microsoft Research Design Expo. The teams’ design solutions reflect the theme “Get Connected, Stay Connected,” which focuses on the merging of exceptional process with ideas. This new platform expands the toolset for scientists in need of large-scale data computation capabilities, making it easier for scientists to use the cloud and access their data. Project Hawaii offers university students the opportunity to explore how the cloud can enhance mobile devices, especially the increasingly ubiquitous smartphone. Why do Microsoft researchers jump at the opportunity to spend time teaching and working at universities? Four researchers explain the attraction. Tony will welcome the attendees of Faculty Summit 2011 and provide a short overview of our collaboration with the research community. He will highlight some of our successful projects and programs and discuss some promising areas for collaboration that hold a high degree of potential value for both academia and Microsoft. The NUI revolution is well underway, and exciting new technologies are transforming how we interact with computers, what they can do for us, and who can use them. Craig Mundie, chief research and strategy officer of Microsoft, explores the technologies Microsoft is investing in and how they are changing the way we live. Representatives from federal agencies will discuss how they see information technology enabling the future in various areas relevant to their agencies’ missions—for example, science, education, health, energy, national security—and the associated federal programs and policy issues. In recognition of the shortcomings of current file management systems, Origin seeks to improve the way in which data is tagged, making its operation far more organic (or brain-like) than any typical system. By tagging data with contextual markers, it delivers users what they want, when they want it without degrading opportunities to search for other data. The Venice brief, “Thicker than Water,” asked students to invent, design, and prototype a system that allows real-time, interactive, but non-verbal communication between dispersed family members. The focus was on sharing emotions, intimacy, and background sensation. Voglia is a connected device, designed as a jewelry pendant, allowing close bodily communication between a couple who are physically apart. In-NEED is a system for managing the community’s response to natural disasters through the use of mobile technologies. In-NEED addresses the humanitarian need of pre-emptive “survivor” systems/networks that engage and mobilize people within the community to act and share existing resources to mitigate the impact of natural disasters in the all-important hours directly preceding the event. By using existing technologies, localized platforms, and developing low-cost community nodes, In-NEED serves as a virtual survival kit. Walk.It is an online platform that allows anyone to create and share neighborhood maps that mimic the same personality and charm of a hand-drawn map from a friend. Believing that the form of the map breeds comfort and familiarity, along with the connected power of community and curation, Walk.It is designed to foster exploration and investigation. It is well known that in many urban centers crime of any kind—but particularly those of a violent nature—are seldom reported. Porta Vox is a system that creates a community-reporting tool that helps track and reduce incidents of crime in urban areas. The belief is that by making the means of reporting present, simple, and connected, it can reduce the stigma and fear that is associated with reporting. The intended outcome is to reduce crime and the fear of crime, thus making cities eminently more livable. The Tongji University project team of interdisciplinary students has focused on the growing trend of parents leaving behind their children in second and third tier cities for the large first-tier cities in hopes of finding better economic opportunities. This trend is growing quickly, currently effecting more than 130 million parents and more than 50 million children who are now being raised by their grandparents. This separation between parent and children has a huge emotional impact and introduces some unique challenges of Chinese society today. The Apart – Together team has focused on a solution to improve the emotional bond between children and parents that are currently living in this situation. With their vast popularity and singular ability to engage young people, digital games have been hailed as a new paradigm for education in the 21st century. But researchers know surprisingly little about how successful games work. What are the key design elements that make certain games compelling, playable, and fun? How do game genres differ in their educational effectiveness for specific topics and for specific learners? How do kids learn when they play games? Does the setting (classroom versus casual) matter? How can games be used to prepare future learning, introduce new material, or strengthen and expand existing knowledge? How are games designed to best facilitate the transfer of learning to everyday lives? And how can we use all of this knowledge to guide future game design? The Games for Learning Institute (G4LI) seeks to answer these questions, pointing the way to a new era of game use in education, by applying a scientifically rigorous approach. Researchers study existing games, identify key design elements and learning patterns, develop prototype mini-games based on these elements and patterns, and evaluate them in classroom and informal learning settings. This talk provided a peek inside how the G4LI does all this. This session introduces the Kinect for Windows SDK, launched just a month ago. We describe its backstory and an overview of its contents. We provide a summary on its first month’s availability and where we are headed together with you – including a key opportunity for feedback from the research community with us today. Later today at DemoFest, we provide a hands-on (hands-free!) opportunity to discuss the SDK and its use in your research and teaching. Tomorrow, we offer the rare opportunity of a full two-session tutorial hosted by some of the key developers of the SDK. I’ve been on a bit of a journey, going from academic, to government, and now to industrial research organizations. What I’ve learned along the way is that computing research is different. Unlike most sciences, distinctions such as “basic” versus “applied” don’t really apply to computing research. Furthermore, recently popularized concepts such as “Pasteur’s Quadrant” are far too limited to be useful. In this talk, I’ll describe my journey and how this has shaped my view of computing research. I’ll explain how this has affected my plans for Microsoft Research Redmond and in the process introduce the DemoFest, which features examples that illustrate the uniqueness of computing’s intoxicating blend of invention, discovery, and engineering. I’ll conclude with some comments on why this is so important to the success of both Microsoft and, more broadly, the computing field. Myth or Reality? Information and Knowledge Acquisition: Has the Problem Been Solved? Myth or Reality? Focus on Information Mining and Intelligence: How Much Inference is Needed? Sho, based on Microsoft’s IronPython, is a dynamic programming environment that connects seamlessly to Microsoft .NET, making a broad set of languages, libraries, and computing resources instantly available to your scripts. It also gives you all of the math and visualization libraries you have come to expect from other computing environments. In this tutorial, we will explain what Sho is and what it can do for you, and also guide you through a series of programming exercises to get you up and running in Sho. We will start with simple plots and matrix computations and lead up to complex connections to custom code, running code on clusters and the cloud, and even making websites that run your algorithms so that you can make your work easily accessible to the world. If you would like to participate in the workshop, please bring your laptop; it would be very helpful if you install the latest version of Sho before you arrive. Even though computer vision remains one of the great unsolved Grand Challenges of computing, vision techniques are maturing at a rapid pace and finding their way into a large number of applications. Among these are natural user interfaces based on a visual understanding of scenes, actions, and three-dimensional data. I will also discuss some of the challenging open problems in our field. Today, social software, which was initially embraced by youth who were interested in self-expression, meeting new people, and staying in touch with friends, influences a broad set of people—including traditional companies, governments, and people of all ages. It has changed the way people socialize online, making words such as: “liking,” “friending,” “status,” and “tweeting” commonplace. Where is social software trending? How does research and innovation in this fast-paced area differ from other traditional areas in computer science? How might we use lessons learned from social software to influence learning and education in the area of science and technology? CodeContracts is a language-agnostic solution to the problem of expressing contracts. CodeContracts include an API to author contracts that is part of .NET as of v 4.0, a runtime checker to improve testing, and a static checker to validate contracts at compile time. We will show the integration with Visual Studio, where contracts will pop up while authoring the code; the runtime checker, where contracts on example subclasses are automatically inherited; and the static checker, where bugs in the program are spotted at design time. Debugger Canvas is a new way for developers to debug C# and Visual Basic code. Created as a collaboration between Brown University, Microsoft Research, and Visual Studio, Debugger Canvas is a pan-and-zoom display containing the parts of the code through which the user has stepped (by using the debugger) or visited (through navigation commands, such as “go to definition”). Debugger Canvas presents the code the user explores as a call-graph diagram in which each node contains the method’s body in a full-featured editor. We’ll show how Debugger Canvas is useful for both program understanding and debugging complex pieces of code. FORMULA—Formal Modeling Using Logic Programming and Analysis—is a modern formal specification language targeting model-based development (MBD). It is based on algebraic data types and strongly typed constraint logic programming, which support concise specifications of abstractions and model transformations. Around this core is a set of composition operators for composing specifications in the style of MBD. A major advantage of FORMULA is its model-finding and design-space exploration facility. FORMULA can be used to construct system models satisfying complex domain constraints. The user inputs a partially specified model, and FORMULA searches the space of completed models until it finds a globally satisfactory design. This process can be repeated to find many globally consistent designs. Variations on this procedure can be used to prove properties on model transformations and to perform bounded-symbolic model checking. Science increasingly communicates through multimedia, yet multimedia sources have not historically lent themselves to robust search and retrieval with traditional search-engine technology. The Microsoft Research Audio Video Indexing System (MAVIS) is a set of software components that use speech-recognition technology to enable deep search into audio and video for actual spoken words, whether they are from meetings, presentations, online lectures, or Internet video. The speech-recognition component of MAVIS is integrated with Windows Azure for high scalability, and the component uses special techniques to help improve the search experience despite speech-recognition inaccuracies. On the front end, MAVIS integrates with Microsoft SQL Server full-text indexing so, operationally, it can enable searching of speech content similar to that of searching text. Microsoft Biology Foundation 2.0 is a bioinformatics tool kit built on Microsoft.NET. One of the tools built on this technology is Genozoom, which addresses an issue facing genome browsers, the inability to support smooth navigation of data from high to low resolutions at rapid speed. Genozoom handles this by utilizing Silverlight and DeepZoom technologies to make it natural for users to navigate and explore the multidimensional information across a genome. In addition, the genome browser will enable the input of custom data and user annotations. Try F# enables the Microsoft .NET language F# to be used in an interactive, browser-based environment. Try F# makes F# accessible to users with Windows, Macs, and—soon—Linux with no installation required. Try F# also includes an online training tool to introduce users to the language. The site serves as a portal for information about the language and its growing community. Try F# was developed by Microsoft Research Connections’ Engineering and Computer Science teams, in collaboration with Microsoft Research Cambridge and the Visual Studio F# development team. Recent advances in visualization technologies have spawned a potent brew of visually rich applications that enable exploration over potentially large, complex data sets. Examples include Gigapan.org, Photosynth.net, PivotViewer, and World Wide Telescope. At the same time, the narrative remains a dominant form for generating emotionally captivating content such as movies and novels or imparting complex knowledge, such as via textbooks or journals. The Rich Interactive Narratives project aims to combine the compelling and time-tested narrative elements of multimedia storytelling with the information rich and exploratory nature of the latest generation of information visualization and exploration technologies. We approach the problem not as a one-off application, Internet site, or proprietary framework, but rather as a data model that transcends a particular platform or technology. This has the potential of enabling entirely new ways for creating, transforming, augmenting, and presenting rich interactive content. Mechanisms for community involvement are able to improve the quality of an automatic translation to a level that satisfies even the most demanding users—and make this a fun, compelling exercise. Cross-language document retrieval and automatic translation, using the example of worldwidescience.org, represents an excellent implementation of multilingual access for the research community. Microsoft Academic Search is a free service developed by Microsoft Research to help users quickly find information about academic researchers and their activities. It serves as a test bed for our object-level vertical-search research in areas such as machine learning, entity extraction, and information retrieval. With Academic Search, it’s easy to find the top researchers, papers, conferences, journals, and organizations in a growing number of research domains. You also can explore a variety of relationships between authors and their papers. We are using World Wide Telescope as a data visualizer for both the Clouds in Space and ASTRA projects. We will demonstrate the visualization of satellite trajectories, as well as show high-altitude flight data collected from the ASTRA 7 flight 18 kilometers into the stratosphere. The Clouds in Space project provides a cloud-based plug-in framework for satellite-trajectory propagation and conjunction analysis and is aimed at improving Space Situational Awareness by predicting potential satellite collisions. The ASTRA—Atmospheric Science Through Robotic Aircraft—project demonstrates the use of Windows Azure as a computing resource to complement low–powered, high-altitude scientific instrumentation. Many data analytics and scientific-computation algorithms rely on iterative computations, in which each iterative step can be specified as a MapReduce computation. Twister4Azure extends the MRRoles4Azure to support such iterative MapReduce executions, drawing lessons from the Java Twister iterative MapReduce framework introduced in Jaliya Ekanayake’s thesis. Iterative extensions include a merge step, in-memory caching of static data between iterations, cache-aware hybrid scheduling using Azure Queues, and a bulletin board. Twister4Azure and MRRoles4Azure offer the familiar MapReduce programming model with fault-tolerance features similar to traditional MapReduce and a decentralized control model without a master node, implying no single point of failure. We test on data-mining algorithms applied to metagenomics and requiring parallel linear algebra in their compute-intensive kernels. Computational fluid-dynamics (CFD) code is used to solve and analyze problems that involve fluid flows. It is a widely used supercomputing application for designing items from rockets to automobiles. We will show an open-source CFD code running transparently on client, cluster, and the Microsoft cloud. We will share our lessons learned for cloud optimization in the areas of model-view-controller architecture, data considerations, and UI design. Excel is an established data-collection and data-analysis tool in business, technical computing, and academic research. Excel offers an attractive user interface, easy-to-use data entry, and substantial interactivity for what-if analysis, but data in Excel is not readily discoverable and, hence, does not promote data sharing. Further, Excel does not offer scalable computation for large-scale analytics. Increasingly researchers face a deluge of data, and when working in Excel, they cannot easily invoke analytics to explore data, find related data sets, or invoke externals models. We present Excel DataScope, which seamlessly integrates cloud storage and scalable analytics into Excel through a research ribbon. Any analyst can use Excel DataScope to discover and import data from the cloud, invoke cloud scale data analytics to extract information from large datasets, invoke models, then store data in the cloud—all through a spreadsheet with which they are already familiar. Visit our booth to explore the new Faculty Connection web-based portal providing access to thousands of curriculum resources for teaching and research. Try using our unique Visual Search with Deep Zoom to find and explore content interactively—from slides to software tools. Pick up our latest Curriculum Resource Kits on Cloud Computing and Operating Systems (including Windows source code), a security-thread-modeling game, and more. In 2011, more touchscreen-based mobile devices, such as smartphones and tablets, will be sold than desktops, laptops, and netbooks combined. In many cases, incredibly powerful, easy-to-use smartphones are going to be the first computing devices—and, in less developed countries, possibly the only ones—owned by virtually everybody and carried by their owners at all times. Microsoft Research provides a novel application-creation environment that enables anyone to script a smartphone anywhere without needing a separate PC. This environment enables to the development of mobile-device applications that can access your data, your media, and your sensors and help you use cloud services, including storage, computing, and social networks. This typed, structured programming language is built around the idea of using only a touchscreen as the input device to author code. In our vision, the state of the program is distributed automatically between mobile clients and the cloud, with automatic synchronization of data and execution between clients and cloud, liberating the programmer from worrying—or even having to be aware of—the details. Flat-panel 3-D display: The display tracks the user and produces an image with both 3-D perspective and 3-D parallax without the user having to wear glasses. Multiview display: Enables different people to watch their own content on the display wherever they are in the room. Looking In: A gesture-controlled microscope that enables the user to look around tiny objects naturally. Next-generation interactive display: Using a semi-transparent OLED and image capture through the display to enable image capture and gesture recognition. Mayhem: A simple-to-use programming event to action programming model. Kinect SLAM: The Kinect device is used to build real-time, dense, 3-D models of room-sized environments while undergoing six-degrees-of-freedom handheld motion. We will demonstrate the use of 3-D projection, combined with a Kinect depth camera, to capture and display 3-D objects. Any physical object brought into the demo can be digitized instantaneously and viewed in 3-D. For example, we will show a simple modeling application in which complex 3-D models can be constructed with a few wooden blocks by digitizing and adding one block at a time. This setup also can be used in telepresence scenarios, in which what is real on your collaborator’s table is virtual—3-D projected—on yours, and vice versa. We will show how simulating real-world physics behaviors can be used to manipulate virtual 3-D objects. Our demo uses a 3-D projector with active shutter glasses. Lifelogging is an emerging research field of capturing user’s experience to support human activities. Images, audio, location, and other contextual information can be recorded. But because such recorded lifelog data tend to be huge, a good method for indexing is essential. We focus on user’s eye information. We will develop a small, wearable eye sensor to recognize a user’s gaze direction and eye movement. Combined with a miniature, eyeglass-mounted camera, it becomes possible to record a user’s view with gaze information. Various image-processing techniques then can be applied to segment objects or texts at which a user looked. We also propose an ear-worn microprojector-camera system to enable wearable, hands-free interaction. We expect such devices can be used to support people in various contexts, including human memory augmentation and mobile assistance. Microsoft .NET Gadgeteer is an open-source tool kit for building small electronic devices using the .NET Micro Framework and Visual C# Express, a free C# development environment. Gadgeteer combines the advantages of object-oriented programming and solderless assembly of electronics with a kit of peripherals and support for quick physical form-factor construction using computer-aided design. This powerful combination enables embedded and handheld devices to be iteratively designed, built, and programmed in hours rather than days or weeks. Microsoft .NET Gadgeteer has been developed by Microsoft Research in collaboration with the .NET Micro Framework product team. This session will provide an overview of the various hardware and software elements of the .NET Gadgeteer platform. Attendees will be introduced to the modular electronics system and learn how individual modules can be connected to build sophisticated devices. Attendees also will learn about how .NET Gadgeteer devices can be programmed easily using C# and debugged interactively in Visual C# Express. Finally, the session will demonstrate how the tool kit supports the design of custom enclosures for .NET Gadgeteer projects, which can be built on demand by using 3-D-printing technologies. Foldit is an online game that enables players to complete and collaborate to fold proteins. Until now, players have been able to interact with the proteins only by using the traditional keyboard and mouse. We will showcase our current work, integrating Kinect as an input device for Foldit. Our goal is to enable multiple hands to interact simultaneously with proteins to offer a more fun, intuitive game interface that would help players to manipulate the protein shape directly in new ways and to use gestures to launch optimizations. The demo enables players to use Kinect to play Foldit and test their protein-folding skills. In addition to a strong focus on eScience, Microsoft Research is also actively investigating the broader concept of eResearch—with an emphasis on Digital Humanities and eHeritage. This booth will offer demonstrations of several compelling new tools: discussion around Project Big Time (an evolution of the ChronoZoom work by Walter Alvarez at University of California, Berkeley), demos of the Garibaldi/LADS project under Andy van Dam at Brown University, as well as Prof. Jun He’s Project Storyteller (Detecting and Tracking Hot Topics to Enhance Search-Engine Performance), and Prof. Jinwook Seo’s Connecting the Past to the Future (Visualizing and Mapping Textural Land Books). The breadth of these projects shows the significant interest Microsoft Research is engaged in beyond eScience with a goal of positively impacting productivity and innovation across the entire academy. myScience is a cloud-enhanced, citizen-science application that changes the way observational research is done. Scientists can use myScience to crowdsource their research projects and harness the power of sensors on smartphones, all with the click of a button on our web portal and without having to write a single line of code. Users can download our mobile app to contribute to a variety of science projects and acquire points across the board. Submitted data is aggregated on the cloud and made available to scientists. Mapster is a system to enable personalized, localized situational awareness by integrating heterogeneous sensor information. A Windows Phone 7 app, it gives users the ability to report any emergencies to Twitter, which are then fetched by the cloud. The map interface on the phone uses the geo-referenced data from the cloud, along with other information such as local crime reports or rainfall data, and enables the user to see a spatiotemporal animation of the changing patterns of the data. In-NEED, a system for managing the community’s response to natural disasters through the use of mobile technologies—from the Ontario College of Art and Design. Walk.It, an online platform that enables anyone to create and share neighborhood maps that mimic the same personality and charm of a hand-drawn map from a friend—from New York University. Apart-Together, technology to enable parents who are living and working out of town because of economic necessity to maintain close contact with their children—from Tonji University. Porta Vox, a system that creates a community-reporting tool that helps track and reduce incidents of crime in urban areas—from Universidad Iberoamericana. Voglia is a connected device, designed as a jewelry pendant, allowing close bodily communication between couples who are physically apart—from University Iuav of Venice. Origin, which uses data from sensors in mobile devices to model personal context for a more natural user interaction—from the University of Washington. The Kinect for Windows SDK beta is a programming toolkit for application developers. It provides the academic and enthusiast communities easy access to the capabilities offered by the Microsoft Kinect device connected to computers running the Windows 7 operating system. The Kinect for Windows SDK beta includes drivers, rich APIs for raw sensor streams and human motion tracking, installation documents, and resource materials. It provides Kinect capabilities to developers who build applications with C++, C#, or Visual Basic by using Microsoft Visual Studio 2010. 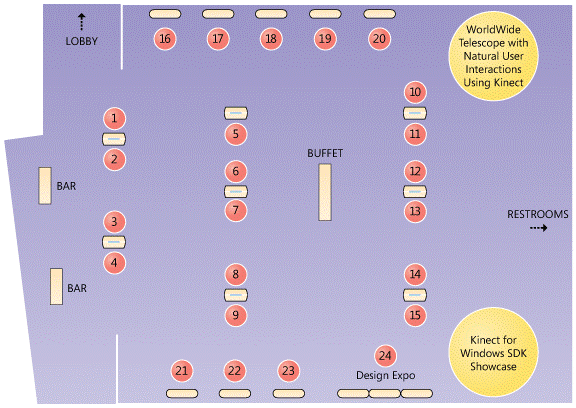 We are going to showcase Kinect SDK sample applications. WorldWide Telescope (WWT) is well-known for serving as the virtual telescope for space. It offers unique, 4-D visualizations—3-D and a time series—and has newly developed APIs to enable visualization of multiple layers of location based-data. WWT also uses Excel to enable researchers to work dynamically with data, then share the data and visualization results. Exemplifying a natural-user-interface approach, navigation will be provided with a gestural user interface enabled by Kinect interoperating with a PC application. Each year, Microsoft Research sponsors a semester-long class at leading design schools. Students are asked to form interdisciplinary teams of two to four students to design a user experience prototype. From these groups, a representative team from each school presents its work to leading academic researchers and educators at the Faculty Summit Design Expo. This annual forum is designed to encourage creative, exploratory thinking and allow students to hone their presentation skills, while gaining valuable feedback from notable design leaders from inside and outside of Microsoft. Students engage with other student design teams worldwide, cross-pollinate ideas and research, and develop lasting ties through social and group activities. Students from each school are mentored by a volunteer liaison from the Microsoft design community. This year’s liaisons include: Nathan Auer, Vince Ball, Richard Banks, Shelley Evenson, Joe Fletcher, Joshua Fisher, Monica Gonzalez, Mike Kasprow (co-host of Design Expo), Tim Regan, Yong Rhee, Asta Roseway, and Curtis Wong (Host of Design Expo). This year’s theme, “Get Connected, Stay Connected,” focuses on the merging of exceptional process with ideas. On Monday, July 18, 2011, the following schools presented their best design solutions to an audience and selected design critics at the Design Expo portion of Faculty Summit 2011. Daniya Ulgen, Vu Chu, Jason Wong, Ben Mabry, Nicholas Smith | University of Washington, Seattle, WA, U.S. In recognition of the shortcomings of current file management systems, Origin seeks to improve the way in which data is tagged, making its operation far more organic (or brain-like) than any typical system. By tagging data with contextual markers, it delivers users what they want, when they want it, without degrading opportunities to search for other data. In-NEED is a system for managing the community’s response to natural disasters through the use of mobile technologies. In-NEED addresses the humanitarian need of pre-emptive survivor systems and networks that engage and mobilize people within the community to act and share existing resources to mitigate the impact of natural disasters in the all-important hours directly following an event. By using existing technologies, localized platforms, and developing low-cost community nodes, In-NEED serves as a virtual survival kit. Walk.It is an online platform that enables anyone to create and share neighborhood maps that mimic the same personality and charm of a hand-drawn map from a friend. Believing that the form of the map breeds comfort and familiarity, along with the connected power of community and curation, Walk.It is designed to foster exploration and investigation. The Tongji University project team of interdisciplinary students has focused on the growing trend of parents leaving behind their children in second- and third-tier cities for the large first-tier cities in hopes of finding better economic opportunities. This trend is growing quickly, currently effecting more than 130 million parents and more than 50 million children who are now being raised by their grandparents. This separation between parent and children has a huge emotional impact and introduces some unique challenges of Chinese society today. The Apart – Together team has focused on a solution to improve the emotional bond between children and parents that are currently living in this situation. Victor Bahl is the director of the Mobile Computing Research Center (MCRC) in Microsoft Research. MCRC’s mission is to invent technologies that make Microsoft’s mobile devices and services indispensable to the world. The center engages in basic and applied inter-disciplinary research, builds proof-of-concept systems, engages with academia, publishes papers in prestigious conferences, publishes software for the research community, and streamlines the transfer of cutting-edge technologies to Microsoft’s product divisions. Prior to MCRC, Victor founded the Networking Research Group and served as its manager for nine years. He continues to help shape Microsoft’s long-term vision related to networking technologies through research and associated policy engagement with governments and institutions around the world. Victor has built several seminal systems with more than 12,500 citations; he has authored more than 110 peer-reviewed papers and 80 patents; he has won best paper awards at SIGCOMM and CoNext and has delivered more than two dozen keynote and plenary talks. He is the founder and past Chair of ACM SIGMOBILE, the founder and steering committee chair of the MobiSys; and the founder and past Editor-in-Chief of ACM Mobile Computing and Communications Review. He has served as the General Chair of several IEEE and ACM conferences including SIGCOMM and MobiCom, and is serving on the steering committees of seven IEEE and ACM conferences and workshop, several of which he co-founded; He is a Fellow of ACM, IEEE and AAAS. He received the IEEE Northwest Region 6 Outstanding Engineer Award, the SIGMOBILE Distinguished Service Award and the DIGITAL Doctoral Engineering Fellowship. Roger Barga an architect in the eXtreme Computing Group (XCG) group of Microsoft Research, where he leads a technical team that builds services for large-scale computing, scientific research, and data analytics on the Windows Azure cloud platform. Previously Roger led the Advanced Research Tools and Services (ARTS) team in Microsoft Research, which built innovative services and tools for data intensive research. Roger joined Microsoft in 1997 as a researcher in the Database Group of Microsoft Research, where he participated in both systems research and product development efforts in database, workflow, and stream processing systems. Mike Barnett is a research software design engineer in the Research in Software Engineering (RiSE) group in Microsoft Research. He has been at Microsoft Research since 1995. Previously, he was an assistant professor at the University of Idaho for three years. He received his Ph.D. from the University of Texas at Austin in 1992. Sumit Basu is a researcher at Microsoft Research in the Machine Learning Group; he joined Microsoft Research after completing his Ph.D. at MIT in 2002. He is one of the architects of Sho, an interactive environment for data analysis and prototyping, which allows for fast and flexible scientific computations in a dynamic language (IronPython) along with seamless connections to compiled Microsoft .NET libraries. Outside of dynamic languages, his research focus is on interactive machine learning, within which he investigates how human judgments, knowledge, and intent can best be taken advantage of to train or guide complex learning algorithms; these days, he is particularly interested in how algorithmic approaches can be used to teach humans new information. He has worked in a variety of application areas for this technology, including interactive tutoring, music creation and analysis, data mining and organization, diagnosing computer systems, and speech/conversational analysis. Steven Bathiche, director of research with the Applied Sciences Group, has been doing applied research at Microsoft since 1999 and was the inventor of a number of Microsoft features and products, including the SideWinder Freestyle Pro game pad, the first commercial gaming device to use accelerometers. He oversaw a complete redesign of the pointer ballistics algorithm that has been shipping in Windows since Windows XP, and he invented the new laser-tracking technology in Microsoft pointing devices. He also is the co-inventor of Microsoft Surface. Bathiche’s interests are in creating novel human interfaces and computer form factors that create new scenarios and user paradigms to improve people’s lives and their digital world. His current technical focus is in the field of co-locating display and sensing technologies. Bathiche obtained his bachelor’s degree in Electrical Engineering from Virginia Tech and a master’s degree in Bioengineering from the University of Washington. Rick Benge is a community program manager in the Health and Wellbeing section of Microsoft Research Connections. Rick is working on developing the community around the Microsoft Biology Foundation, a language neutral Microsoft .NET bioinformatics toolkit. Prior to his current role, Rick worked as a release program manager in the Microsoft Visual C/C++ group as part of Visual Studio. Rick has worked at a variety of roles in Microsoft spanning a 16-year career, including a prior stint in Microsoft Research working on a code optimization technology. Hrvoje Benko is a researcher at Microsoft Research. He explores novel interactive computing technologies and their impact on human-computer interaction. In particular, he is interested in surface computing, multitouch and freehand gestural input, 2-D and 3-D interactions, and augmented reality. Benko is the author of more than 25 scientific conference papers and journal articles. His work has been featured in The New York Times, The Seattle Times, and Popular Science, and on popular technology blogs such as Gizmodo, Engadget, CNET, and Ars Technica. He received his Ph.D. in Computer Science from Columbia University in 2007, working with Steven Feiner. Maureen has more than 30 years of experience working with college students, faculty, and professionals in the areas of student retention, leadership, teams, diversity, and broadening participation in computing. In addition to serving as assistant dean for Diversity and Education for Indiana University’s School of Informatics and Computing, Maureen is the co-principal investigator and program manager for the Alliance for the Advancement of African-American Researchers in Computing, is co-chair of the Academic Alliance for the National Center for Women in Information Technology, and chair of the Indiana Aspiration in Computing 2011 statewide competition for high school girls. She has been a co-principal investigator on several other Broadening Participation in Computing grants, including STARS, Georgia Computes!, Increasing the Representation of Undergraduate Women and Minorities in Computer Science, and Extending Contextualized Computing in Multiple Institutions Using Threads. She has co-authored papers on topics such as peer-led, team-learning to improve success and retention in computer science introductory classes, retention of computer science majors, and improving secondary computer science education. She is also involved in pre-collegiate level computer science education, she was founding vice president of the Computer Science Teacher’s Association and she developed the Institute for Computing Education, a partnership between the Georgia Department of Education and the GT College of Computing. Judith Bishop is director of Computer Science at Microsoft Research. Her role is to create strong links between Microsoft’s research groups and universities globally, through encouraging projects, supporting conferences, and engaging directly in research. Her expertise is in programming languages and distributed systems, with a strong practical bias and an interest in compilers and design patterns. She initiated the Software Innovation Foundation (SEIF) and is currently working on a new way of running programs in browsers (especially F#). Judith received her Ph.D. from the University of Southampton and was previously in academia, having been a professor at the Universities of Witwatersrand and Pretoria, with visiting positions in the UK, Germany, Canada, Italy, and the United States. She is currently an honorary professor at the University of Cape Town. Judith serves frequently on editorial, program, and award committees, and has received numerous awards and distinctions. Mark Bolas is an associate professor at the School of Cinematic Arts and the Institute for Creative Technology at USC. His work focuses on immersive experience design and embodied interface design with an emphasis on the consideration of the interplay between emotion, cognition, and perception. Mark is the Chairman of Fakespace Labs, has designed a number of tactile interface devices including early work on multi-user workbench and tabletop systems, and was the recipient of the IEEE 2005 award for Seminal Technical Achievement in Virtual & Augmented Reality by the Visualization and Graphics Technical Committee. Dr. Cristian Bonacic is a DVM, M.Sc., DPhil., associate professor, wildlife scientist, and lecturer in wildlife conservation at the Faculty of Agriculture and Forestry Science from Catholic University of Chile (PUC–Chile). He is also the director of Fauna Australis Laboratory. He is head of the Environmental Science Diploma and of the MSc program in Conservation and Wildlife Management, and is a member of the Wildlife Trust Alliance and associate researcher of the Wildlife Conservation Research Unit (WildCRU, Oxford). Dr. Bonacic is adjunct researcher of CERC, Columbia University. In 2007, he received a Whitley commendation for his work in innovation for conservation science from HRH Princess Royal at the Royal Geographical Society of London. Cati Boulanger, a researcher in Microsoft’s Applied Sciences Group, received her Ph.D. in 2010 from the Tangible Media Group at the MIT Media Lab, under the guidance of Hiroshi Ishii, after extensive coursework in electrical engineering and sensing technologies. She specializes in the design of hybrid physical/digital objects for play, performance, and psycho-physiotherapy, exploring the simplicity of tangible and gestural object interaction combined with the flexibility of digital systems. Boulanger graduated from the Massachusetts Institute of Technology in 2002 with a master’s degree in Media Arts and Sciences and then from Harvard University in 2006 with a master’s in Product Design. A knowledge shopper at heart, she received Bachelor of Science degrees in computer science (computational linguistics, artificial intelligence) and applied math (economics), with a minor in fine arts (photography) and a master’s in computer sciences. Boulanger is the author of more than 30 peer-reviewed academic publications. Donald Brinkman manages external programs in digital humanities, digital heritage, and games for learning at Microsoft Research. Before joining Microsoft Research, Donald served for two years as a technical program manager for the Microsoft education group. In that role, he was responsible for defining vision of innovative business intelligence and analytics for education as well as driving a variety of enterprise-scale server capabilities. Prior to joining Microsoft, he spent eight years in developmental and technical roles acquiring and executing government research contracts in areas such as quantum computation, signals intelligence, electromagnetic and kinetic simulations, behavioral economics, game theory, and cross-cultural communications. Donald is a writer, painter, game designer, and a passionate advocate of the benefits of building bridges between technical and humanist disciplines. He is particularly interested in disruptive technologies that take advantage of crowd sourcing, social computing, culture jamming, transmedia, and other non-traditional approaches. Donald supports the Games for Learning Institute, a consortium of 8 universities, 14 principal investigators, and a small army of graduate students whose mission is to explore what makes games fun, what makes them educational, and how to best blend the two goals. He helped to develop ChronoZoom, and is now developing Big Time—web services to support tools to visualize massive time scales for the purpose of teaching Big History and enabling massively multidisciplinary research. He is the Microsoft champion for the Just Press Play project, an experiment to transform the undergraduate education of 750 students at Rochester Institute of Technology into a gameful narrative. Other projects include Project Garibaldi and Game Show NYC. Carlos Henrique de Brito Cruz was born in Rio de Janeiro, Brazil. He graduated in Electrical Engineering from Instituto Tecnológico da Aeronáutica (ITA, 1978), received the MSc degree in Physics (1980) and a DSc degree in Physics (1983), both from the Physics Institute “Gleb Wataghin” at the State University at Campinas (Unicamp). During 1981, Brito Cruz was a researcher at the Quantum Optics Laboratory, at the University of Rome. In 1982, Brito Cruz was appointed a professor at the Physics Institute at Unicamp. During 1986 and 1987, Brito Cruz worked as a resident visitor at AT&T Bell Laboratories in Holmdel, New Jersey. In 1990, he was a visitor for three months at Bell Labs, Murray Hill, New Jersey. Brito Cruz has been the vice president of the Brazilian Physics Society (SBF). He served as a member of the International Advisory Committee of the Optical Society of America (OSA) and has been the director of the Physics Institute at Unicamp for two terms. He has been the dean of Research at the State University at Campinas (Unicamp) and from 1996 till 2002 he has served as the president of the Foundation for the Support of Research in the State of São Paulo, FAPESP. From April 2002 to April 2005, he was the rector of The State University of Campinas, Unicamp. Since 2005, Brito Cruz is the president of the Technology and Competitiveness Council of the São Paulo Federation of Industry (FIESP). In 2010 Brito Cruz was a member of the 12-member special committee formed by the Inter Academy Council, at the request of the U.N. Secretary General, to review the procedures of IPCC. Since 2005, he has been the scientific director at the São Paulo Research Foundation, FAPESP, which is one of the main research funding agencies in Brazil. At FAPESP he oversees the reception of 18,000 research proposals every year, analyzing them through a rigorous peer reviewing system. Besides supporting research in all fields, he organized broad research special programs in Bioenergy and Global Climate Change, fostering research on these fields through calls for proposals and obtaining industry and foreign agencies collaborations and co-funding. Brito Cruz is a member of the Brazilian Academy of Sciences. Shoshanna is a partner program manager for Windows Azure Marketplace DataMarket. In her 15-year career at Microsoft, Shoshanna has focused on unlocking the potential of data for all users—from the tools developers use, to design databases, to approachable query design tools for information workers, to repositories and metadata solutions supporting the application lifecycle, and now to data itself. Shoshanna has a B.S. and an M.S. in Computer Science. Her experience in the software industry, prior to joining Microsoft, includes criminal intelligence solutions, visual programming languages, and authoring systems. Justine Cassell joined Carnegie Mellon University in August 2010 as director of the Human-Computer Interaction Institute in the School of Computer Science. A member of the faculty at Northwestern University from 2003 to 2010, she was the founding director of its Center for Technology and Social Behavior, and before that was a tenured professor at the MIT Media Lab. Cassell won the Edgerton Prize at MIT, held the AT&T Research Chair at Northwestern, and was honored in 2008 with the Women of Vision award from the Anita Borg Institute. She is a CRA and ACM Distinguished Lecturer. Lili Cheng is general manager of the Future Social Experiences (FUSE) Labs in Microsoft Research, focused on delivering new social, real-time, and media-rich experiences for home and work, including projects such as: Kodu—tools to teach kids programming and creativity, Montage—visual albums of social data, Docs for Facebook, and social productivity tools. At Microsoft since 1995, Lili was also director of User Experience for Microsoft Windows, where from 2004 to 2006 she oversaw design, user research, user assistance, and advanced development for Windows Vista. Prior to Microsoft, Lili worked in Apple Computer’s Advanced Technology Group, on the User Interface research team, where she focused on QuickTime Conferencing and QuickTime VR. Lili is also a registered architect; she worked in Tokyo and Los Angeles for Nihon Sekkei and Skidmore Owings and Merrill on commercial urban design and large-scale building projects. Behrooz Chitsaz is director of IP Strategy for Microsoft Research. He joined Microsoft in 1991 as a program manager, and over the next 11 years, he worked on more than a dozen Microsoft products, including the first three versions of Microsoft Exchange and the Windows 2000 Server. Before joining Microsoft Research in 2002, Chitsaz was group program manager of Active Directory Services, the core infrastructure for the Windows Security system. After joining Microsoft Research, he managed the Program Management team, which is responsible for technology transfer to Microsoft product groups. He is responsible for developing and executing on strategies for bringing various Microsoft Research technologies to market. Seth Cooper is the creative director of the Center for Game Science at the Computer Science and Engineering department at the University of Washington. He is interested in using video games to solve difficult real-world problems. He is chief architect and lead designer of Foldit, a video game that has allowed more than 100,000 players to contribute to biochemical scientific research. He has also developed game technologies for character control and real-time crowd simulation. Simon Cox is director of the Microsoft Institute of High Performance Computing at the University of Southampton. His research focuses on how tools, technologies, and platforms can make engineering and scientific processes faster, cheaper, and better. Mary Czerwinski is a research area manager of the Visualization and Interaction Research group at Microsoft. She holds a Ph.D. in Cognitive Psychology from Indiana University in Bloomington. Mary has been an affiliate member of the Psychology Departments at the University of Washington and Rice University, and sits on several academic and professional advisory boards. Much of Mary’s work focuses on novel information visualization and interaction techniques. She is a distinguished scientist of the Association for Computing Machinery and was recently elected into the association’s Special Interest Group on Computer Human Interaction’s CHI Academy, an honorary group of individuals who have made extensive contributions to the study of Human Computer Interaction and who have led the shaping of the field. In her keynote address, she will speak about work that Microsoft’s Visualization and Interaction Research group is working on such as interruptions, multitasking, and group awareness. Robert DeLine is a principal researcher at Microsoft Research, working at the intersection of software engineering and human-computer interaction. His research group designs development tools in a user-centered fashion: they conduct studies of development teams to understand their work practice and prototype tools to improve that practice. Rob has a background in both HCI and software engineering. His master’s thesis was the first version of the Alice programming environment (University of Virginia, 1993), and his PhD was in software architecture (Carnegie Mellon University, 1999). Vikram Dendi is the group product manager for the Microsoft Translator product team. He is responsible for product planning, partner strategy, and experience design for the team that delivers translation functionality within products like Microsoft Bing, Office, and Internet Explorer. Before his current assignment, Dendi held roles in the Phone, Mapping, and Emerging Markets groups within Microsoft. Lee Dirks is director of Education and Scholarly Communication at Microsoft Research Connections, where he manages a variety of research programs related to open access to research data, interoperability of archives and repositories, preservation of digital information, and the application of new technologies to facilitate teaching and learning in higher education. A veteran of more than 20 years of work across multiple information-management fields, Dirks holds a Master of Library Science degree from the University of North Carolina at Chapel Hill and a post-master’s degree in Preservation Administration from Columbia University. In addition to past positions at Columbia and in preservation resources at the Online Computer Library Center, he has held a variety of roles at Microsoft since joining the company in 1996, as corporate archivist, corporate librarian, and senior manager in the corporate market-research organization. Susan Dumais is a principal researcher and manager of the Context, Learning, and User Experience for Search (CLUES) Group at Microsoft Research. Prior to joining Microsoft in 1997, she was at Bellcore and Bell Labs where she developed Latent Semantic Indexing, a well-known statistical method for concept-based retrieval. Her current research focuses on the temporal dynamics of information systems; user modeling; and personalization, interactive retrieval, and search evaluation. She has worked closely with several Microsoft groups (Bing, Windows Desktop Search, SharePoint Portal Server, and Office Online Help) on search-related innovations, and has published widely in the areas of human-computer interaction and information retrieval. Susan is also an adjunct professor at the iSchool at the University of Washington. She was elected to the CHI Academy in 2005, an ACM Fellow in 2006, received the Gerard Salton Award from SIGIR for Lifetime Achievement in 2009, and was elected to the National Academy of Engineering (NAE) in 2011. Jaliya Ekanayake is a systems researcher in the eXtreme Computing Group (XCG) at Microsoft Research. His research interests focus on distributed systems and parallel computing, and in XCG, he works on algorithms and runtimes for large-scale data analytics on clouds. He received a Ph.D. in Computer Science from Indiana University, where he was advised by Geoffrey Fox. Ekanayake’s Ph.D. work on Iterative MapReduce has led to several well-recognized publications and an open-source project called Twister. Before coming to Indiana University, he worked as a software engineer at Lanka Software Foundation in Sri Lanka. Ekanayake holds a Bachelor of Science degree in Computer Science and Engineering from the University of Moratuwa in Sri Lanka. Earning a BSc in Biological Sciences and MSc in Ecology by State University of Campinas (UNICAMP – Brazil), Tiago E. M. Duque Estrada has always been very concerned with the amount of data that is produced in research that results in only the output of scientific papers or theses. After a diploma in Geographic Information Systems, he has been studying the influence of space on ecological processes. His Chevening Scholarship in United Nations Environment Program – World Conservation Monitoring Centre was crucial for the development of his concerns on how to use data for the decision-making process in environmental governance. For years, he has been developing projects on conservation with nongovernmental organizations in the areas of data collection, analysis, and management. In the past year, he has started working with the BIOTA/FAPESP program supporting the re-development of SinBIOTA among other activities as assistant editor of the journal, Biota Neotropica. Deborah Estrin (Ph.D., Massachusetts Institute of Technology, 1985; B.S., University of California Berkeley, 1980) is a professor of Computer Science, postel chair in Computer Networks, and founding director of the Center for Embedded Networked Sensing (CENS). Her early research focused on Internet protocol design. In 2002, she founded CENS to develop environmental monitoring technologies and applications. Most recently, Estrin and collaborators are developing and deploying participatory sensing systems, taking advantage of location, image, and user-contributed data streams that are available from mobile phones. Projects include: self-monitoring applications for health and wellness, Participatory Sensing campaigns for community data gathering, citizen science, and STEM education. Her honors include: American Academy of Arts and Sciences (2007), National Academy of Engineering (2009), ACM-W Athena Lecturer (2006), Anita Borg Women of Vision Award for Innovation (2007), WITI hall of fame (2008), and Doctor Honoris Causa EPFL (2008) and Uppsala University (2011). Manuel Fahndrich is a senior researcher at Microsoft. He is passionate about code-analysis techniques and getting tools onto programmer’s desktops. He is interested in enabling people to program on smartphones and tablets. Prior projects include CodeContracts, tools for specification and verification usable by ordinary programmers, designing and implementing the Sing# programming language for Singularity, non-null types for Spec#, and API protocols through Fugue and Vault. He earned his Ph.D. from the University of California, Berkeley, in 1999 on constraint-based program analysis. Tracy Fullerton, M.F.A., is an experimental game designer, professor, and director of the Game Innovation Lab at the University of Southern California (USC) School of Cinematic Arts where she holds the Electronic Arts Endowed Chair in Interactive Entertainment. The USC Game Innovation Lab is a design research center that has produced several of the most influential projects to be released in the emerging field of independent games, including games like Cloud, flOw, Darfur is Dying, The Misadventures of P.B. Winterbottom, and The Night Journey—a collaboration with media artist Bill Viola. Tracy is also the author of “Game Design Workshop: A Playcentric Approach to Creating Innovative Games,” a design textbook in use in game programs worldwide. Prior to entering academia, she was a professional game designer and entrepreneur making games for companies including Microsoft, Sony, and MTV, among many others. Dr. Dennis Gannon is director of Cloud Research Engagements for the eXtreme Computing Group in Microsoft Research. Dr. Gannon’s research interests include cloud computing, data analytics. and “big data” platforms, large-scale cyberinfrastructure, distributed computing, parallel programming, computational science and problem solving environments. At Microsoft he and his team are working with the research community to demonstrate the potential of cloud computing to enable broad access to data-intensive scientific research. Prior to coming to Microsoft, Dr. Gannon was a professor and former chair of computer science at Indiana University and the science director for the Indiana Pervasive Technology Labs. He has published more than 100 refereed articles and he has co-edited 3 books. Dr. Gannon received his Ph.D. in Computer Science from the University of Illinois Urbana–Champaign after receiving a Ph.D. in Mathematics from the University of California, Davis. Ann Quiroz Gates is the associate vice president of Research and Sponsored Projects at the University of Texas at El Paso and past chair of the Computer Science Department. Her research areas are software property elicitation and specification, and workflow-driven ontologies. Gates directs the NSF-funded Cyber-ShARE Center that focuses on developing and sharing resources through cyber-infrastructure to interdisciplinary advance research and education. She was a founding member of the NSF Advisory Committee for Cyberinfrastructure, and she served on the Board of Governors of IEEE–Computer Society 2004–2009. She is a member of the Computer Science Accreditation Board (2011–2013). Gates leads the Computing Alliance for Hispanic-Serving Institutions (CAHSI), an NSF-funded consortium that is focused on the recruitment, retention, and advancement of Hispanics in computing and is a founding member of the National Center for Women in Information Technology (NCWIT), a national network to advance participation of women in IT. Gates received the 2010 Anita Borg Institute Social Impact Award and the 2009 Richard A. Tapia Achievement Award for Scientific Scholarship, Civic Science, and Diversifying Computing; she was named to Hispanic Business magazine’s 100 Influential Hispanics in 2006 for her work on the Affinity Research Group model that focuses on development of undergraduate students involved in research. Elizabeth L. Grossman is a member of the Technology Strategy and Policy Group at Microsoft. This group helps shape Microsoft’s long-term vision and strategy for technology innovations and the company’s associated engagement on the potential policy issues related to emerging technologies. Areas of focus are broad, including the relationship of information technology to communication and social interaction, research and innovation, education and learning, and energy and the environment. Prior to joining Microsoft, Dr. Grossman was at Lewis-Burke Associates, a firm that provides strategic advice and government relations for research universities and scientific societies; staff director for the Research Subcommittee of the House Committee on Science, with oversight responsibilities for the National Science Foundation, interagency programs in information technology and nanotechnology, and innovation; and program officer at the National Research Council. Dr. Grossman received a B.A. from Swarthmore College and an M.S. and Ph.D. in Computational Physics from the University of Chicago. Carl received his B.A. from the University of Chicago in 1979 and his Ph.D. from the University of Wisconsin at Madison in 1985. He worked as a postdoctoral researcher at Carnegie-Mellon University and the University of Cambridge in England before joining the faculty of the University of Pennsylvania in 1987 and the University of Illinois in 2004 where he is now a professor in the Computer Science Department. He serves as the director of Illinois Security Lab, the Center for Health Information Privacy and Security, and the Strategic Advanced Research Projects on Security (SHARPS). Professor Gunter has made research contributions in the semantics of programming languages, formal analysis of networks and security, and privacy. His recent research focuses on security and privacy issues for the electric power grid and healthcare information technologies. Dean Guo is a principal program manager in the Microsoft Research Connections division of Microsoft Research. He joined Microsoft in 1999. He holds a Ph.D. in Bioinformatics from the University of Utah. He has 14 years of software development experience ranging from developing an expert system for patient disease diagnosis to enterprise application integration of complex systems. He has been the lead program manager for shipping several Microsoft Research projects, such as Project Trident: A Scientific Workflow Workbench; Terapixel, the largest and clearest image of the night sky available in the WorldWide Telescope and Bing Map; Try F#, for running F# programs in a browser; and WorldWide Telescope Add-in for Excel. Anoop Gupta is currently distinguished scientist at Microsoft Research where he reports to Rick Rashid, senior vice president and global head of Microsoft Research. From 2007 to 2009, he was corporate vice president (CVP) of Technology Policy and Strategy at Microsoft. During this period, Gupta also served as CVP of the Unlimited Potential Group and Education Products Group. From 2003 to 2007, he was CVP of Microsoft’s Unified Communications Group, leading the company’s efforts in business communications solutions (email, IM, VoIP, and conferencing). From 2001 to 2003, Gupta was technology assistant to Bill Gates. From 1997 to 2003, he led the Collaboration and Multimedia Group at Microsoft Research. Before joining Microsoft in 1997, Gupta was professor of Computer Science at Stanford University for 11 years. In 1995, Gupta co-founded VXtreme Inc., which Microsoft acquired in 1997. Gupta has a B.Tech. from IIT Delhi in 1980 receiving President’s Gold Medal, and a Ph.D. in Computer Science from CMU. Kerry Hammil is a senior program manager for the Development and Engineering Strategy team at Microsoft Research. Born and raised in New Delhi, India, Sahil Handa is a Computer Engineering junior at the University of Illinois at Urbana–Champaign. He is working at Qualcomm as a software-engineering intern. He has a keen interest in computer vision, distributed systems, and mobile computing, and he took the course Extending Mobile Computing Through Cloud Computing and worked closely with the National Center of Super Computing Applications and his peers to develop an Emergency Situational Awareness application. David Haynor is professor of Radiology (Neuroradiology)—with adjunct appointments in Bioengineering, Statistics, and Neurological Surgery—at the University of Washington. His areas of research interest include statistical approaches to image reconstruction, user interfaces for image viewing systems, and bioinformatics. Jun He is an associate professor at School of Information, Renmin University of China. He received his M.S. and Ph.D. degrees from the Department of Computer Science at the Renmin University of China. His research areas include social-network analysis, data mining, machine learning, and databases. He is the leader of the Data Mining Group at the Renmin University of China. He was a visiting researcher at University of Illinois at Urbana–Champaign in 2005. He has published more than 50 papers in leading conferences and journals. His group’s research interests are focusing on structured web mining, link-similarity computing, social-network analysis, and recommendation. He received the Society for Industrial and Applied Mathematics Conference on Data Mining’s Best Paper Award, one of the most prestigious awards in data mining, in 2010. As corporate vice president in Microsoft Research, Tony Hey is responsible for worldwide university research collaborations with Microsoft researchers. Hey is also responsible for the multidisciplinary eScience Research Group within Microsoft Research. Before joining Microsoft, Hey served as director of the U.K.’s e-Science Initiative, managing the government’s efforts to build a new scientific infrastructure for collaborative, multidisciplinary, data-intensive research projects. Before leading this initiative, Hey led a research group in the area of parallel computing and was head of the School of Electronics and Computer Science, and dean of Engineering and Applied Science at the University of Southampton. Hey is a fellow of the U.K.’s Royal Academy of Engineering and was awarded a CBE for services to science in 2005. He is also a fellow of the British Computer Society, the Institute of Engineering and Technology, the Institute of Physics, and the U.S. American Association for the Advancement of Science (AAAS). Tony Hey has written books on particle physics and computing and has a passionate interest in communicating the excitement of science and technology to young people. He has co-authored popular books on quantum mechanics and on relativity. Dun-Yu Hsiao is a Ph.D. student in the Center for Game Science in the Computer Science and Engineering department at the University of Washington. He made the iPhone app for PhotoCity, a real-world flag-capturing game in which players make 3-D models of buildings by taking photos. He now works on the Foldit team. Foldit is a game to let people manipulate protein structures to solve science puzzles. His contribution is to integrate Foldit with Microsoft Kinect for Xbox 360, which will enable players to fold a protein by using their hands. He hopes to explore the possibility of introducing a more natural way to help the problem-solving process. Ethan Jackson is a researcher in the Foundations of Software Engineering group at Microsoft Research. His research focuses on the theoretical and practical aspects of model-based development. He is one of the main developers of the FORMULA modeling framework, a cutting-edge specification language and analysis tool for constructing and analyzing models of software systems. Jackson holds a Ph.D. in Computer Science from Vanderbilt University and received a Bachelor of Science in Computer Engineering from the University of Pittsburgh. Jens Jacobsen is a program manager in the Microsoft Visual Studio Ultimate group. He works on visualizations of code and other user experiences to aid developer productivity. Farnam Jahanian serves as the United States National Science Foundation assistant director for the Computer and Information Science and Engineering (CISE) Directorate. He holds the Edward S. Davidson Collegiate Professorship at the University of Michigan (on leave), where he served as chair for Computer Science and Engineering from 2007 to 2011 and as director of the Software Systems Laboratory from 1997 to 2000. His research on Internet infrastructure security formed the basis for the Internet security company Arbor Networks, which he co-founded in 2001. He served as chairman of Arbor Networks until its acquisition by Tektronix Communication in 2010. Dr. Jahanian guides the CISE directorate, with a budget of approximately US$620 million, to support fundamental and transformative advances that are key drivers of economic competitiveness in computer and information science and engineering, and which are crucial to achieving national priorities in those areas. He also serves as co-chair of the Networking and Information Technology Research and Development (NITRD) Subcommittee, providing overall coordination for the activities of 14 government agencies. Dr. Jahanian holds a master’s degree and a Ph.D. in Computer Science from the University of Texas at Austin. He is a Fellow of AAAS, ACM and IEEE. Alex is the senior program manager on the OData team at Microsoft. He is responsible designing new features in the OData protocol and working with the OData community. Before that, Alex worked on the Entity Framework team for a couple of years, helping create the vastly improved second version. Prior to joining Microsoft, Alex created two object relational mappers and a relational file system, dabbled in his own startup, and consulted for approximately 10 years, so he is something of a veteran in the data programmability space. His vision is a world where computers are easy even for his mum. Gavin Jancke is general manager of engineering for Microsoft Research. Over the last seven years, he built and currently runs the Advanced Development and Web Experience teams. He is also a member of the Microsoft Research Redmond Leadership Team that guides and runs the Redmond lab and takes a leading role in setting engineering strategy, direction, and capability for the global division. The 30-person, multi-disciplinary Advanced Development team develops software and hardware technologies and components based on Microsoft Research innovations, from technical transfer to the main Microsoft product groups, large scale prototyping and deployment, and internal lab engineering needs. The Web Experience team rebuilt a new world-class production website for Microsoft Research as well as an associated publication platform. The team designs, engineers, and runs the worldwide organization’s line-of-business solutions, and provides web design and engineering expertise to help the worldwide research teams deploy their projects and ideas on the web in a consumable and web scalable form. Harold Javid’s original field of investigation was optimization and nonlinear control system design. He earned his B.S., M.S., and Ph.D. degrees in Electrical Engineering from the University of Illinois. Upon completing his Ph.D., he chose to move directly to industry in order to follow his passion for applying theory to significant practical problems. Examples of his results while working at Systems Control, Inc. in Palo Alto, California, and GE in Schenectady, New York, include Markov chain-based dynamic optimization algorithms for hydroelectric power scheduling for public utilities in Colombia, real-time feedback control of steam turbines, and coal gasification systems. In 1984, Harold became director of Electronics for Acrowood Corporation where he led efforts to create real-time embedded optimizers and nuclear instruments for use in the lumber and pulp and paper industries. In 1988, he joined the Research and Technology Group in the Boeing Company where he led teams involved in developing industrial simulation tools. In 1998, Dr. Javid joined Microsoft as Group Manager for Visual C++ Support. After enjoying a number of different opportunities to exercise his managerial skill at Microsoft, Harold happily joined Microsoft Research where has enjoyed the sweet intersection of technical interests and program management activities. As director of Americas/ANZ Regional Programs, he is focused on collaborating with academia to advance technology to make a difference in areas such as Earth, Energy, and Environment; Health and Wellbeing; Digital Scholarship; and Computer Science. Ralph Johnson is an associate professor at the University of Illinois at Urbana–Champaign. He is one of the co-authors of Design Patterns; leader of the group that developed the Smalltalk Refactoring Browser, which was the first automated refactoring tool; and leader of the group developing Photran, a refactoring tool for Fortran 77, 90, 2003 and 2008. Rane Johnson-Stempson is the Education and Scholarly Communication Research Program director for Microsoft Research Connections, where she engages with academics worldwide and identifies high-impact areas for research investigations. Previously, as the worldwide director of Education Strategy, she was responsible for multi-stakeholder partnerships, the Cisco–Intel–Microsoft Alliance, the World Economic Forum–Global Education Initiative, and the Fast Track Initiative–Private Constituency. She also helped our teams around the world use the power of technology to accelerate the transformation of education in order to meet local government priorities to drive economic and workforce development in the 21st century. After nine years at Microsoft, Rane has held a variety of positions. She started as a Public Sector global account manager, Server and Tools Core Infrastructure field liaison, CEE Regional Core Infrastructure product manager, and was CEE regional leader responsible for developing and supporting the mission of helping all IT professionals and IT managers in CEE reach their full potential. Rane is very passionate about education and technology, with 15 years of experience. She has served as the executive director of California Skills USA-VICA, IT project manager for Guidant Corporation, middle school math and science teacher, and IT director for the San Francisco Unified School District. She has sat in the boards of top education non-profit organizations and on legislative committees and task forces. Rane earned a B.S. in Mechanical Engineering and a B.A. in Economics/Finance from Bucknell University and an Executive MBA in Transformational Leadership George Fox University. Steven Johnston is a senior research fellow on the University of Southampton Faculty of Engineering and the Environment. He has worked on large-scale distributed systems such as BioSimGrid and has experience with high-performance computing, service-oriented architecture, and data repositories. He was the lead architect in CFMS, demonstrating in partnership with Microsoft, Airbus, Rolls Royce, BAE Systems, and MBDA how novel software-plus-services approaches can improve productivity significantly for scientists and engineers. He has extensive experience with cloud-computing architectures and is working to demonstrate cloud-computing capabilities for Space Situational Awareness. Rajeev Joshi is a senior engineer with the Laboratory for Reliable Software at the NASA Jet Propulsion Laboratory (JPL) in Pasadena, California. His main research interests are in the study and application of formal methods to the specification and verification of software. He is currently also a member of the flight software development team for the Mars Science Laboratory Mission (MSL), serving as responsible engineer for the rover data management system, the filesystems, and spacecraft high-level communication behaviors. Before joining JPL, he worked as a researcher at the Compaq/HP Systems Research Center (SRC) in Palo Alto, California where, among other projects, he worked on the Denali superoptimizer and the theorem prover Verifun. Before starting graduate school, he also worked as a Senior Technical Associate with the Math Sciences Research Group at AT&T Bell Laboratories in Murray Hill, New Jersey. He holds a Ph.D. in Computer Sciences from the University of Texas at Austin. Joseph M. Joy is a principal architect for Microsoft Research India. The first 14 years of his professional career was in product development, mostly in the Microsoft Windows Operating System division, working primarily in the area of clustering, networking, and telephony. In 2005, after 14 years in Redmond, he joined Microsoft Research India, where, until November 2007, he headed the Advanced Development Group. Joy’s primary interests are in multimedia storytelling, software engineering, and semi-structured information retrieval. Mike is a 12-year veteran of digital design. This is his sixth year of involvement with Design Expo. Creative director and vice president of Trapeze Media in Toronto, he leads one of Canada’s most successful digital agencies, working with clients like Kraft, Bonefish Grill, Mitsubishi Motors, and Revlon, among others. Mike works with his team to innovate and commercialize through design and technology, balancing the needs of the consumer with those of his clients to move forward briskly and fearlessly. Genevieve L’Esperance is an undergraduate at McGill University in Montreal, studying both Psychology and Computer Science. A Microsoft Certified Professional at the age of 15 and a Microsoft Certified Technology Specialist at 16, she started teaching programming to girls by using Microsoft Small Basic to inspire them to engage in community outreach and global education as future participants in the technology industry. Her mandate as an intern at Microsoft Research is a collaboration with a team consisting of her mentor, Curtis Wong, and Alyssa Goodman of the Harvard–Smithsonian Center for Astrophysics to develop content for the Worldwide Telescope Ambassadors program, which will facilitate the growth of scientific resources that are available within this portal for educators and focus the site’s social reach on a younger demographic. Tim Large, a researcher in Microsoft’s Applied Sciences Group, works on the development of next-generation displays and sensors for human-computer interfaces. Before joining Microsoft, he ran a small consulting business specializing in optical systems and component design. The company worked on displays, sensors, spectrometers, lighting systems, and adaptive optics. Earlier, he worked for The Technology Partnership and Nortel Networks. While at Nortel, he led a team that adapted landline systems for use on long-distance, repeater-less 10-gigabit Ethernet links, including systems he helped design for the north English Channel, the Irish Sea, the Philippines, and Taiwan. Large holds a Bachelor of Arts degree in Natural Sciences with a specialization in Physics from Christ’s College, University of Cambridge. Kristin Lauter is an American mathematician and cryptographer whose research interest is broadly in application of number theory and algebraic geometry in cryptography. She is particularly known for her work in the area of elliptic curve cryptography. She is currently a researcher and the head of the Cryptography Group at Microsoft Research in Redmond, Washington. Lauter received her Bachelor of Arts, Master of Science, and Ph.D., all in mathematics, from the University of Chicago, in 1990, 1991, and 1996, respectively. Prior to joining Microsoft, she held positions as a visiting scholar at Max Planck Institut für Mathematik in Bonn, Germany (1997), T.H. Hildebrandt research assistant professor at the University of Michigan (1996–1999), and a visiting researcher at Institut de Mathematiques Luminy in France (1999). In 2008, Lauter, together with her coauthors, was awarded the Selfridge Prize in Computational Number Theory. Ed Lazowska is the Bill & Melinda Gates Chair in Computer Science & Engineering at the University of Washington, and is the founding director of the University of Washington eScience Institute. He serves as chair of the Computing Community Consortium, a national effort to engage the computing research community in fundamental research motivated by tackling societal challenges. He is a member of the National Academy of Engineering and a Fellow of the American Academy of Arts and Sciences. He is a member of the Microsoft Research Technical Advisory Board, and of the Executive Advisory Council of the National Center for Women and Information Technology. Peter Lee recently joined Microsoft as distinguished scientist and managing director of Microsoft Research Redmond. Microsoft Research Redmond’s mission is to make fundamental advances in computer science and engineering, and then use those advances to help drive innovations in new and existing products and services. Prior to Microsoft, Peter was an office director at the Defense Advanced Research Projects Agency (DARPA), where he was responsible for developing and implementing the strategic vision and technical plans for a new office that conducted high-risk, high-payoff research projects spanning computer security, social networking, supercomputing, and many other areas of computer science. Peter was formerly a professor and head of the Computer Science Department at Carnegie Mellon University (CMU), having also served briefly as the vice provost for Research. He joined the CMU faculty in 1987, after completing his doctoral studies at the University of Michigan. Peter is an active researcher, educator, administrator, and servant to the academic community. His research contributions lie mainly in areas related to the foundations of software reliability, program analysis, security, and language design. He is an ACM Fellow, member of the National Research Council’s Computer Science and Telecommunications Board, and former chair of the Board of Directors of the Computing Research Association and its Government Affairs Committee. Peter is the author of two books, has authored or co-authored more than 50 refereed papers, and has advised or co-advised 14 completed Ph.Ds. Rustan Leino is principal researcher in the Research in Software Engineering (RiSE) group at Microsoft Research. He is a world leader in building automatic program verifiers and is generally known for his work on programming methods and program verification tools. He has led a number of programming language and verification projects, including Spec# (which extends C# with contracts and was a forerunner of the Code Contracts in Microsoft .NET 4.0), Chalice (for concurrent programs), Dafny (for functional-correctness verification), and, previously, ESC/Java. He is the architect of the Boogie program verification framework, which underlies more than a dozen program verifiers for C, Spec#, and other languages. Before getting his Ph.D. (Caltech, 1995), Leino designed and wrote object-oriented software as a technical lead in the Windows NT group at Microsoft. Leino collects thinking puzzles on a popular webpage and has started the Verification Corner video show on channel9.msdn.com. Lu Li earned a bachelor’s degree in Software Engineering at Wuhan University in China. During her undergraduate studies, she participated in research on the application of context awareness in requirement analysis and in bioinformatics research about bacteria-species identification. She has had a paper published about each field. She is pursuing a master’s degree in Management Science and Engineering at Stanford University and exploring data mining and cloud computing. This summer, she is interning at Cisco and working on a research project on near real-time analytics. Francesco Logozzo is a researcher at Microsoft. His main research interest is abstract interpretation with applications to program analysis and optimization. He has been working on designing and implementing the static program checker shipped with CodeContracts. Before joining Microsoft, Francesco was a post-doc at the École Normale Supérieure in Paris. He earned his Ph.D. from École Polytechnique under the supervision of Radhia Cousot. Wei Lu is a systems researcher in the eXtreme Computing Group at Microsoft Research. He is working on a project to enable large-data analytics on the cloud. Before that, he was involved in a number of research projects to enable large-scale scientific applications run on Windows Azure. Lu received his Ph.D. from Indiana University in 2008 with research interests focusing on parallel, multicore computing, and grid computing. Moshe Lutz joined Microsoft’s Applied Sciences Group in 2010 as a research software-development engineer and works in the hardware-software boundary to create new experiences in human-machine interaction. Before joining the group, Lutz worked on several versions of Microsoft Office, including integrating an advanced social user interface into the product. Lutz holds a Bachelor of Arts degree from University of California, Berkeley in both Math and Music and a Master of Science degree from the University of Washington in Computer Science. Yunxiao Ma is an associate researcher in Web Data Management Group at Microsoft Research Asia. He is in charge of the online serving and API of Academic Search. His research interests include web-scale data mining, distributed systems, and information retrieval. Before joining Microsoft, he received a Bachelor of Science degree from the Beijing University of Aeronautics and Astronautics in 2003 and a Master of Science degree from Peking University in 2006. Adnan Mahmud is a program manager for Microsoft Research Asia responsible for tech transfer and incubation projects. Adnan is part of the team building Academic Search. Prior to Microsoft Research Asia, Adnan was in Microsoft Office responsible for all the feedback pipelines utilized by Office. Adnan has multiple patents in data analysis and visualization. John McGee is the director of Cyberinfrastructure at the Renaissance Computing Institute, managing enterprise and research IT infrastructure and leading a team of software developers to enhance the capability and productivity of scholarly efforts. Mr. McGee recently participated on the National Science Foundation ACCI Campus Bridging Taskforce, serves as the engagement area coordinator for the Open Science Grid, and has been involved in managing academic research programs beginning in 2001 as the co-executive director of the GRIDS Center while at the University of Southern California’s Information Sciences Institute. Prior to the GRIDS Center, McGee served in various technical and management roles in the private sector and in university administration including vice president for Business Development for a high tech startup, director of Information Systems for a Silicon Valley startup, and software development and team management. Deborah McGuinness is the Tetherless World Professor of Computer and Cognitive Science, and the founding director of the Web Science Research Center at Rensselaer Polytechnic Institute. Deborah is a leading authority on the semantic web and has been working in knowledge representation and reasoning environments for more than 25 years. Deborah’s primary research thrusts include work on explanation, trust, ontologies, escience, open data, and semantically-enabled schema and data integration. Prior to joining RPI, Deborah was the acting director of the Knowledge Systems, Artificial Intelligence Laboratory and senior research scientist in the Computer Science Department of Stanford University. Deborah is also widely known for her leading role in the development of the W3C recommended Web Ontology Language (OWL) and her work on earlier description logic languages and environments. She has built and deployed numerous ontology environments and ontology-enhanced applications, including some that have been in continuous use for more than a decade at AT&T and Lucent, and two that have won deployment awards for variation reduction on plant floors and interdisciplinary virtual observatories. She has published more than 150 peer-reviewed papers and has authored granted patents in knowledge-based systems, ontology environments, configuration, and search technology. Deborah received her bachelor’s degree in Math and Computer Science from Duke University, her master’s degree in Computer Science from University of California at Berkeley, and her Ph.D. in Computer Science from Rutgers University. Domingo Mery was born in Santiago de Chile in 1965. He received the M.Sc. degree in Electrical Engineering from the Technical University of Karlsruhe, Germany, in 1992, and the Ph.D. degree with distinction at the Technical University of Berlin, in 2000. He was a research scientist at the Institute for Measurement and Automation Technology at the Technical University of Berlin with the collaboration of YXLON X-Ray International. He was a recipient of a scholarship from the Konrad–Adenauer Foundation, and a scholarship from the German Academic Exchange Service (DAAD) for his Ph.D. work. He was an associate researcher in 2001 in the Department of Computer Engineering at the University of Santiago, Chile. Since 2004, he has been associate professor at the Department of Computer Science at the Catholic University of Chile. He was chair of the Computer Science Department from 2005 to 2009. His research interests include image processing for fault detection in aluminum castings, X-ray imaging, real-time programming and computer vision. He is author of more than 50 technical SCI publications, and more than 60 conference papers. He was program general chair of the PSIVT2007, program chair of PSIVT2009 and general co-chair of PSIVT2011 (Pacific-Rim Symposium on Image and Video Technology), and 2007 Iberoamerican Congress on Pattern Recognition. He served on the program committees of several conferences: PSIVT2006, I-SPAN 2009, WCC–2006, SCCC–2003, SCCC–2009, SCCC–2010. MICAI 2008, RobVis 2008, VIE 2007, CERMA 2008–2010, and ACCV–2009–2010. He received the Ron Halmshaw Award, established for the best paper published in Insight Journal on industrial radiography. Dr. Rosemary Monahan is a computer science lecturer at the National University of Ireland, Maynooth (NUIM), where she lectures program verification, program language semantics, and computer programming. In addition to co-presenting tutorials on the Spec# Programming System at ETAPS 2008, ECOOP 2009, iFM 2010, and SMBF 2010, Rosemary has delivered courses on the Spec# Programming System to students at NUIM, at both undergraduate and postgraduate level, and at Universite Henri Poincare 1, Nancy, France. Rosemary’s research, as part of the Principles of Programming (PoP) group at NUIM, is concerned with the static and dynamic analysis of object-oriented programs. Through an ongoing collaboration with the Research in Software Engineering (RiSE) group at Microsoft Research, she contributed to the extension of the Spec# Programming System to support the verification of several challenging programming examples. This work also involves the successful verification of benchmarks for software verification by using the associated tool suite. Michał Moskal works at Microsoft Research in Redmond on software verification, automated theorem proving, and programming languages. During his Ph.D. studies at the University of Wrocław in Poland, he has developed Nemerle—a high level programming language for the Microsoft .NET platform, and (using Nemerle) Fx7—a satisfiability modulo theories (SMT) solver. While finishing the Ph.D,. he joined European Microsoft Innovation Center in Aachen in early 2008 and was instrumental to development of VCC—a formal verifier for concurrent C programs utilizing SMT technology. VCC represents the state of the art in semi-automatic C verification and has been used on tens of thousands of lines of industrial C code. In late 2009, after receiving the Ph.D. degree with honors and prime minister award, Michał has moved to the RiSE group at Microsoft Research Redmond and continued to work on VCC while also taking on other projects including Boogie intermediate verification language, SPUR tracing JIT, and DKAL authorization engine. In late 2010, Nikolai Tillmann and Michał started the Programming on Mobile Devices project—an effort to create an integrated development environment for writing programs on the phone for the phone. Craig Mundie is chief research and strategy officer of Microsoft Corp., reporting to CEO Steve Ballmer. In this role, he oversees Microsoft Research, one of the world’s largest computer-science research organizations, and is responsible for Microsoft’s long-term technology strategy. Mundie also directs a number of technology incubations, and works with government and business leaders around the world on technology policy, regulation, and standards. Mundie has spent much of his career building startups in various fields, including supercomputing, consumer electronics, education, healthcare, and robotics. He joined Microsoft in 1992 to create and run the Consumer Platforms Division, which developed non-PC platforms such as the Windows CE operating system; software for the Handheld PC, Pocket PC, and Auto PC; and early console-gaming products. Mundie also started Microsoft’s digital-TV efforts, acquiring and managing its WebTV Networks subsidiary, and built its fast-growing healthcare solutions business. Emerson Murphy-Hill is an assistant professor at North Carolina State University. By conducting formative studies, building tools based on the findings, and then evaluating the effect that those tools have on software developers’ work, his research aims to bridge the gap between the capabilities of tools and how software developers actually use them. He received his Ph.D. from Portland State University in 2009 and his B.S. from The Evergreen State College in 2001. Karen Ng is the lead program manager on the Visual Studio Professional team. She is responsible for delivering the future versions of the Visual C# and Visual Basic language services and compilers to enable our next generation of programming models and expose our compilers-as-a-service. Previously, she owned the Visual C# and Visual Basic IDE’s in Visual Studio—including features such as IntelliSense, code refactoring, call hierarchy, and code snippets. Karen was also a core team member of the Language Integrated Query (LINQ) team and drove the design-time experience for the LINQ effort. Prior to joining Microsoft in August 2004, she worked as a research assistant at the MIT Media Laboratory working on applying pattern recognition techniques to design intelligent human-computer interactions. Karen holds a master’s degree in Media Technology from the Massachusetts Institute of Technology and a bachelor’s degree from Wellesley College in Computer Science. Mike Ortiz is working toward completing his bachelor’s degree in Computer Science, with a focus on human-computer interaction, at Stanford University. He worked on the myScience web team, specifically designing the WYSIWYG project launch page and the data-visualization page. His primary interest is designing intuitive, user-facing interfaces, and he hopes this desire was evident in the work he did for myScience. Joe Pamer is the senior development lead for the F# team at Microsoft. He has been with Microsoft for six years, the majority of that time having been spent on F#. Ken Perlin, a New York University (NYU) professor of Computer Science, directs the NYU Games For Learning Institute; was founding director of the Media Research Laboratory, directed the NYU Center for Advanced Technology; and researches graphics, animation, user interfaces, and science education. He received an Academy Award for Technical Achievement, the 2008 ACM/SIGGRAPH Computer Graphics Achievement Award, the TrapCode award for computer graphics achievement, the NYC Mayor’s award for excellence in Science and Technology, the Sokol award for outstanding NYU Science faculty, and an NSF Presidential Young Investigator Award. Ken has been a featured artist at the Whitney Museum of American Art, received his Ph.D. in Computer Science from NYU, B.A. in mathematics from Harvard, was head of Software Development at R/GREENBERG Associates, systems architect for computer animation at MAGI, served on the Board of Directors of the New York chapter of ACM/SIGGRAPH and the New York Software Industry Association, and was 2010 general chair of UIST. Pratch Piyawongwisal is an undergraduate student at the University of Illinois at Urbana–Champaign, majoring in Computer Engineering. He has a keen interest in distributed systems and mobile computing. Last semester, he and his friends created a Windows Phone 7 application called Mapster as a part of a class, Extending Mobile Computing Through Cloud Computing. 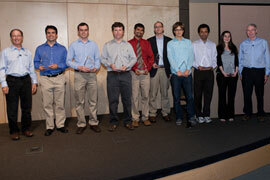 Their application subsequently won the Cloudiest App award in a competition sponsored by Microsoft Research. Christophe Poulain is a senior research software-design engineer on the Microsoft Research Connections team at Microsoft Research. He is interested in the development and application of software to solve problems that involve massive amounts of data and computation, particularly in the field of scientific or engineering problems such as those described in the book The Fourth Paradigm. At Microsoft Research, he has had great fun working on a series of interesting, seemingly unrelated projects. These include the academic release of DryadLINQ for Dryad on Windows HPC clusters; building visualizations for WorldWide Telescope, including Terapixel, the largest and clearest seamless image of the night sky; and, most recently, Try F#. Vivek Pradeep is a computer-vision researcher in Microsoft’s Applied Sciences Group. He received his Bachelor of Science degree in Electronics and Communications Engineering from the Indian Institute of Technology Roorkee in 2005 and a Ph.D. from the University of Southern California in 2010. His thesis on developing a wearable Simultaneous Localization and Mapping system that provided tactile navigation cues to the visually impaired was awarded the Stevens Institute for Innovation’s most innovative project award. His research interests include structure from motion, stereo vision, sensor fusion, tracking, and GPU computing. Jane received in B.S. from the University of Illinois Urbana and her Ph.D. from the University of Virginia. She was a faculty member in the Computer Science Department at the University of Virginia for 11 years before joining Microsoft Research in January, 2004 where she led the Tablet Technologies in Higher Education initiative. In fall 2009, she started the Microsoft Research gender diversity and pipeline initiative. Jane also spent two years as a program manager in the Division of Undergraduate Education at the National Science Foundation. She is currently a member of the IEEE CS Board of Governors, the CRA Board of Directors, and the ACM Education Board as well as numerous university and department advisory boards. Jaime Puente is the director of Microsoft Research Connections responsible for Microsoft Research’s engagements in Latin America and the Caribbean. Prior to joining Microsoft Research, Jaime spent 13 years as a professor in the School of Electrical and Computer Engineering at Escuela Superior Politécnica del Litoral (ESPOL) in Ecuador. Jaime Puente was a Fulbright Scholar for his early engagement with academia. It was during his time as a Fulbright Scholar that he started to lecture and conduct research in a wide variety of academic and professional fields exploring how academia and industry needs intersect. His academic background includes an M.S. in Computer Engineering from Iowa State University, an MBA and an Electronics Engineering degree both from ESPOL in Ecuador, as well as an Educational Specialist post-master’s degree from NOVA Southeastern University in Florida, United States. Jaime Puente is currently a Ph.D. candidate in the Graduate School of Computer and Information Sciences at NOVA Southeastern University. His main research interests are in computing for the developing world, learning technologies, and specifically how to enhance learning through human-computer interaction. Judy Qiu is an assistant professor of Computer Science in the School of Informatics and Computing at Indiana University and an assistant director of the school’s Digital Science Center. Her research interests are parallel and distributed systems, cloud computing, and high-performance computing. Qiu leads the SALSA project, involving professional staff and Ph.D. students from the School of Informatics and Computing. SALSA focuses on data-intensive computing at the intersection of cloud and multicore technologies with an emphasis on life science applications by using MapReduce and traditional parallel computing approaches. Qiu also is active in program service and supporting diversity in computing, which includes serving as a program co-chair of the second IEEE International Conference of Cloud Computing Technology and Science 2010. She is on the editorial board of the International Journal of Cloud Computing. Dr. Rajeev Ram’s primary focus at ARPA-E is in advanced electrical components and systems ranging from transportation to the generation and transmission of electric power. He has worked in the areas of semiconductor devices, microscopic heat transfer, and bioprocess development for much of his career. In the early 1990’s, he developed the III-V wafer bonding technology that led to the first telecom wavelength surface-emitting laser and record brightness light emitting devices at Hewlett-Packard Laboratory in Palo Alto. Since 1997, Dr. Ram has been on the Electrical Engineering faculty at the Massachusetts Institute of Technology (MIT) and Associate director of the Research Laboratory of Electronics and director for the Center for Integrated Photonic Systems. While at MIT, he founded two companies in the areas of bioprocess development for biofuels and advanced thermal imaging. He has served on the Defense Sciences Research Council advising DARPA on new areas for investment. His group’s work on small-scale solar thermoelectric generation is being deployed for rural electrification in the developing world as SolSource and was recognized with the St. Andrews Prize for Energy and the Environment in 2009. Dr. Ram holds degrees in Applied Physics from California Institute of Technology and Electrical Engineering from the University of California, Santa Barbara. As senior vice president, Richard (Rick) F. Rashid oversees worldwide operations for Microsoft Research, an organization encompassing more than 850 researchers across six labs worldwide. Under Rashid’s leadership, Microsoft Research conducts both basic and applied research across disciplines that include algorithms and theory; human-computer interaction; machine learning; multimedia and graphics; search; security; social computing; and systems, architecture, mobility, and networking. His team collaborates with the world’s foremost researchers in academia, industry, and government on initiatives to advance the state-of-the-art of computing and to help ensure the future of Microsoft’s products. After joining Microsoft in September 1991, Rashid served as director and vice president of the Microsoft Research division and was promoted to his current role in 2000. In his earlier roles, Rashid led research efforts on operating systems, networking, and multiprocessors, and authored patents in such areas as data compression, networking, and operating systems. He managed projects that catalyzed the development of Microsoft’s interactive TV system and also directed Microsoft’s first e-commerce group. Rashid was the driving force behind the creation of the team that later developed into Microsoft’s Digital Media Division. Jun Rekimoto received his Bachelor of Science, Master of Science, and Ph.D. degrees in Information Science from the Tokyo Institute of Technology, in 1984, 1986, and 1996, respectively. Since 1994, he has worked for Sony Computer Science Laboratories (Sony CSL). In 1999, he formed, and has since directed, the Interaction Laboratory within Sony CSL. Since 2007, he has been a professor in the Interfaculty Initiative in Information Studies at The University of Tokyo. Rekimoto’s research interests include human-computer interaction, computer-augmented environments, and computer-augmented humans. He has invented several interactive systems and sensing technologies and has published hundreds articles on human-computer interactions. He received the Multi-Media Grand Prix Technology Award from the Multi-Media Content Association of Japan in 1998, the iF Interaction Design Award in 2000, the Japan Inter-Design Award in 2003, and the iF Communication Design Award in 2005. In 2007, Rekimoto was elected to the ACM’s SIGCHI Academy. Arkady Retik is a director overseeing technical faculty-engagement programs in Microsoft’s Education Group. Previously, he managed several development projects in the Windows Management Infrastructure group, and he was part of the Shared Source Initiative and managed the Windows Academic Program, making Windows Kernel source code available to universities worldwide. Before joining Microsoft in 2000, Retik served for a decade as a researcher, faculty member, and professor in several universities, mainly in the United Kingdom. He taught and researched a variety of subjects in computing and engineering. He established and directed the Virtual Construction Simulation Research Group at the University of Strathclyde in Glasgow, Scotland, pioneering research in advanced visualization and virtual reality. He has published several books and more than 40 papers. He holds a Doctor of Science degree from Technion, the Israel Institute of Technology. He recently was made a visiting honorary professor at Glasgow Caledonian University. A principal research software design engineer for Microsoft Research, Eric Rudolph is currently working on the Kinect for Windows SDK, his focus is on the video capture system and the unmanaged NUI runtime, but he helped somewhat on the managed video interfaces as well. Prior to that, he was the technical lead for the Microsoft Tag project, a mobile phone barcode detection system. Eric’s special areas of “expertise” (if you could call it that), is in audio/video capture, synchronization, and playback, and creating software development kits (SDKs). Prior to Microsoft Research, Eric was a tech lead on Media Foundation and DirectShow. Arjmand Samuel is a research program manager at Microsoft Research Connections. Arjmand is responsible for building academic research partnerships related to mobile computing and software engineering. Arjmand has a Ph.D. in Information Security from Purdue University. He has published in a variety of publications on topics of privacy and security in the healthcare domain and social media. He has published several patents and contributed to books on access control models. His recent research interests are in the areas of abuse-prevention and privacy in social media, and, cloud–enhanced mobile computing. Bobby Schnabel is dean of the School of Informatics at Indiana University. In this position, he leads a multi-campus school of approximately 100 faculty members at the Bloomington and Indianapolis campuses, including undergraduate and graduate programs in the departments of computer science and informatics at Bloomington and in informatics at Indiana University Purdue University Indianapolis. He is a professor of computer science and informatics at Indiana University Bloomington. From 2009 to 2010 he also served as interim Indiana University vice president for research. Dr. Schnabel was on the computer science faculty of the University of Colorado at Boulder from 1977 to 2007. He served as vice provost for Academic and Campus Technology from 1998 to 2007, and as founding director of the Alliance for Technology, Learning and Society (ATLAS) from 1997 to 2007. Dr. Schnabel is a co-founder and executive team member of the National Center for Women & Information Technology. He also serves as chair of the advisory committee for the Computing Alliance of Hispanic Serving Institutions and was a founding co-PI of the Alliance for the Advancement of African-American Researchers in Computing. Scarlet Schwiderski-Grosche is a research program manager at Microsoft Research Cambridge, working for Microsoft Research Connections in the Europe, Middle East, and Africa region. She is in charge of the Microsoft Research Ph.D. Scholarship Program and coordinates a number of research projects. She has a Ph.D. in Computer Science from the University of Cambridge and was in academia for almost 10 years before joining Microsoft in March 2009. In academia, she worked as a lecturer in Information Security at Royal Holloway, University of London. Jinwook Seo is an assistant professor in the School of Computer Science and Engineering at Seoul National University in Korea. He founded the university’s Human-Computer Interaction Laboratory in 2009. His research interests include human-computer Interaction, information visualization, and biomedical informatics. Seo received his Bachelor of Science degree in 1995 and his Master of Science degree in 1997, both in Computer Science from Seoul National University. He then taught computer science courses to cadets at the Korea Air Force Academy for three years. He later worked with Ben Shneiderman at the Human-Computer Interaction Laboratory at the University of Maryland and earned his Ph.D. in Computer Science in 2005. He received the Long-Term Impact Award during the IEEE VisWeek Discovery Exhibition in 2009 for his work on the Hierarchical Clustering Explorer. He has served on conference organization and program committees such as IEEE VisWeek and IEEE PacificVis. Amit Sheth is an educator, researcher, and entrepreneur. He is the LexisNexis Ohio Eminent Scholar and an IEEE Fellow. He directs the Ohio Center of Excellent in Knowledge-enabled Computing (Kno.e.sis) at the Wright State University. Kno.e.sis is one of the largest two academic groups in the United States in Semantic Web and Web 3.0. His current interests center around computing for human experience—semantics empowered sensors, services, and social computing on ubiquitous web. His key publications are in federated databases, workflow management, and Semantic Web. He is the EIC of International Journal on Semantic Web and Information Systems, joint EIC of the journal of Distributed and Parallel Databases, and co-editor of two book series. His work has resulted in W3C and e-Science community standards. By licensing technology from his University research, he had founded two successful companies. Several commercial products and many operationally deployed applications have resulted from his research and development. Dr. Howard Shrobe joined DARPA as a program manager in 2010. His research and development interests relate to cyber resilience, computer architectures, software technologies and artificial intelligence with his initial focus being on new computer system architectures for secure and resilient computing. He currently directs two programs: CRASH (Clean-slate design of Resilient Adaptive Secure Hosts) and Mission-oriented Resilient Clouds. Shrobe joined DARPA from MIT’s Computer Science and Artificial Intelligence Laboratory, with which he has been affiliated since 1978, and for which he served as associate director of the Artificial Intelligence Laboratory from 1997 to 1998. Shrobe also has a previous tour with DARPA as a Chief Scientist in the Information Technology Office (1994 to 1997). Shrobe holds Doctor of Philosophy and Master of Science degrees in Computer Science from the Massachusetts Institute of Technology and a Bachelor of Science in Mathematics from Yale College. Dr. Khan M. Siddiqui is the principal program manager, platform engineering for health solutions group at Microsoft Corp., with a faculty appointment as visiting associate professor of Radiology at Johns Hopkins University School of Medicine, Baltimore, Maryland. Formerly, he was the president and CEO of iVirtuoso, a healthcare search company, providing semantic search technology for the healthcare sector. He is the chair of IT and Informatics Committee and a member of Commission on Research and IT for the American College of Radiology; he serves on the IHE Radiology Planning Committee and the Society for Imaging Informatics in Medicine (SIIM) online communications and education committees, and is a member of the Radiological Society of North America (RSNA) scientific program committee. He was the immediate past chair of the Advanced PACS-based Imaging Informatics, and Therapeutic conference for the SPIE medical imaging. Prior to joining Microsoft, Dr. Siddiqui was the chief of imaging informatics and cardiac imaging at the VA Maryland Healthcare system and program director for the imaging informatics fellowship at University of Maryland. Before joining Microsoft’s Applied Sciences Group, Matheen Siddiqui received his Bachelor of Science degree in Computer Systems Engineering in 2000 and a Master of Science degree in Signal Processing in 2002, both from Boston University. He then worked as a senior software engineer at Cognex, solving computer-vision, calibration, and image-alignment problems. He received his Ph.D. in Computer Science from the University of Southern California in August 2009. His research interests include computer vision, machine learning, pattern recognition, image processing, motion capture, computer graphics, and scientific computing. Radu is an associate professor of Computer Science at Stony Brook University. He remembers when gophers were digging through the Internets (a series of tubes) and bits were running at slower paces of 512 per second. Radu is interested in efficient computing with a touch of cyber-security paranoia. Kurt Squire is a senior investigator and creative director of the Educational Research Challenge Area at the Morgridge Institute for Research, while on leave from the University of Wisconsin–Madison where he is an associate professor in Curriculum and Instruction. Squire’s research focuses on the impact of contemporary gaming practices on learning, schooling, and society. His early work focused on using civilization to teach world history. Since then, he has transitioned to studying mobile, place-based games and games for improving scientific citizenship. Squire’s current work uses games to transform public participation in science. He is the author of Video Games and Learning (2011), published by Teachers College Press, co-editor of Games + Learning + Society, published by Cambridge Press, and more than 75 articles and chapters on technology in education. Also a designer or co-designer on several educational games, Squire’s work has been funded by the National Science Foundation, MacArthur Foundation, and Department of Education. Munirathnam Srikanth is an applied researcher in Microsoft Online Services Division. His research interests are in the areas of ontology learning from different data sources, knowledge acquisition, representation, and use in search and discovery applications. Srikanth is also interested in user modeling, recommendation systems, and exploring a combination of statistical and semantic approaches for content and user understanding. Prior to joining Microsoft, Srikanth was director of Research and Development at Lymba Corporation/Language Computer Corporation, working on their natural language question-answering system and knowledge acquisition efforts. Srikanth holds a Ph.D. in Computer Science from the State University of New York at Buffalo and a master’s degree in Systems Design Engineering from the University of Waterloo, Ontario, Canada. Carlos Garcia Jurado Suarez is a research software design engineer in the Microsoft Research Advanced Development Team. As part of this team he gets to work on a wide range of research areas and technologies. His projects have included text rendering, low level networking, security protocols, user interfaces, Bluetooth, and most recently, audio processing for Kinect. Prior to joining Microsoft Research, Carlos worked on the Microsoft Visual Studio team building frameworks and graphical designs for the enterprise editions of Visual Studio. Richard Szeliski is a principal researcher at Microsoft Research, where he leads the Interactive Visual Media Group. He is also an affiliate professor at the University of Washington, and is a Fellow of the ACM and IEEE. Dr. Szeliski pioneered the field of Bayesian methods for computer vision, as well as image-based modeling, image-based rendering, and computational photography, which lie at the intersection of computer vision and computer graphics. His most recent research on Photo Tourism and Photosynth is an exciting example of the promise of large-scale image-based rendering. Dr. Szeliski received his Ph.D. degree in Computer Science from Carnegie Mellon University, Pittsburgh, in 1988 and joined Microsoft Research in 1995. He has published more than 150 research papers in computer vision, computer graphics, medical imaging, neural nets, and numerical analysis, as well as the books Bayesian Modeling of Uncertainty in Low-Level Vision and Computer Vision: Algorithms and Applications. Stewart is a senior research program manager at Microsoft Research Connections and acting product manager for the Kinect for Windows SDK from Microsoft Research. He is responsible for Microsoft’s academic research partnerships related to Natural User Interface (NUI), especially device-oriented, including Cyber-Physical Systems (CPS), robotics, and sensor networks. Before joining Microsoft in 2001, he spent 13 years in the telecommunications industry in software research and development, focusing on technology transfer. Stewart has a Ph.D. in Artificial Intelligence applied to Engineering from Loughborough University, UK. He has published a variety of papers on robotics for education, artificial intelligence, and network management as well as several patents, and co-authored a book on software engineering for artificial intelligence applications. In 2009, he co-edited The Fourth Paradigm, a book that collates visionary essays on the emerging field of data-intensive science. His recent research interests have centered on multi-device NUI, social human-robot interaction, robotics as a context for computer science education, sensor networks, and ubiquitous computing. Kristin M. Tolle, Ph.D., is a director in the Microsoft Research Connections team and a clinical associate professor at the University of Washington. Since joining Microsoft, Dr. Tolle has acquired several patents and worked for several product teams, including the Natural Language Group, Visual Studio, and Excel. Prior to joining Microsoft, Dr. Tolle was a research associate at the University of Arizona Artificial Intelligence Lab, where she managed the group on medical information retrieval and natural language processing. Her research interests include contextual computing, natural language processing and machine translation, mobile computing, user intent modeling, natural user interactions, and information extraction. Andries van Dam is a professor of computer science and former vice president for Research at Brown University in Providence, Rhode Island. Together with Ted Nelson, he designed the first hypertext system on commercial equipment, the Hypertext Editing System, in 1967. He co-authored Computer Graphics: Principles and Practice along with J.D. Foley, S.K. Feiner, and John Hughes. He also co-founded the precursor of today’s ACM SIGGRAPH conference. He currently teaches an introductory course in computer science and courses in computer graphics at Brown University. He consults for Microsoft Research, which also is a sponsor of his research. Evelyne Viegas is the director of Semantic Computing at Microsoft Research, based in Redmond, Washington. Semantic Computing is about interacting with data in rich, safe, and semantically meaningful ways to create the path from data to information, knowledge, and intelligence. In her current role, Evelyne is building initiatives that focus on information seen as an enabler of innovation, working in partnership with universities and government agencies worldwide. In particular, she is creating programs around computational intelligence research to drive open innovation and agile experimentation via cloud-based services, and projects to advance the state-of-the-art in knowledge representation and reasoning under uncertainty at web scale. Jan Vitek is a faculty scholar and professor of Computer Science at Purdue. He works on programming language technologies with applications to real-time computing. Prof. Vitek led the Ovm project, which resulted in the first open-source, real-time Java virtual machine to be flight-tested in 2005. He has since investigated virtual machine technologies for safety-critical embedded systems. He was general chair of PLDI, LCTES, and ISMM as well as program chair of ECOOP, VEE, Coordination, and TOOLS. He is a member of the JSR-302 Safety Critical Java expert group and of the IFIP 2.4 working group on compilers and software technologies. Alex Wade is director for Scholarly Communication within the Microsoft Research Connections team, where he oversees several projects and partnerships with academia related to researcher productivity, academic search, research data management, and virtual research environments. Alex holds a bachelor’s degree in Philosophy from University of California Berkeley, and a master’s of Librarianship degree from the University of Washington. During his career at Microsoft, Alex has managed the corporate search and taxonomy management services; has shipped a SharePoint-based document and workflow management solution for Sarbanes-Oxley compliance; and served as program manager for Search in the Windows Vista and Windows 7 releases. Prior to joining Microsoft, Alex was systems librarian at the University of Washington, and held technical library positions at the University of Michigan and the University of California at Berkeley. Haixun Wang is a researcher at Microsoft Research Asia in Beijing, China. Before joining Microsoft, he was a research staff member at IBM T. J. Watson Research Center for nine years. He was technical assistant to Stuart Feldman (vice president of Computer Science of IBM Research) from 2006 to 2007, and technical assistant to Mark Wegman (head of Computer Science of IBM Research) from 2007 to 2009. Haixun Wang has published more than 120 research papers in referred international journals and conference proceedings. He is associate editor of IEEE Transactions of Knowledge and Data Engineering (TKDE) and the Journal of Computer Science and Technology (JCST). He is PC co-chair of CIKM 2012, ICMLA 2011, and WAIM 2011. Haixun Wang received the ER 2008 Conference best paper award (DKE 25-year award), and ICDM 2009 Best Student Paper run-up award. Chris Wendt, a group program manager for Microsoft Research, graduated as Diplom-Informatiker from the University of Hamburg in Germany and subsequently spent a decade on software internationalization for a multitude of Microsoft products, including Windows, Internet Explorer, MSN, and Windows Live, bringing these products to market with equal functionality worldwide. Since 2005, he has led program management and planning for Microsoft’s machine-translation development, responsible for Bing Translator and Microsoft Translator services. Jevin West is a post-doctoral researcher in the Department of Biology at the University of Washington. His research focuses on citation networks. In this type of network, an edge represents a citation and a node represents a journal, author, or paper. These networks contain millions of nodes and hundreds of millions citations. The primary aim of his research is to use the structure of these well preserved networks to better assess and to better navigate the ever expanding scholarly universe. He is the head developer of Eigenfactor.org—a free website for librarians, researchers, publishers, administrators, and editors that ranks and maps scholarly journals. Jevin’s most recent projects involve collaborations to further develop these tools on article level data by using digital repositories like JSTOR, the Social Science Research Network, and the Microsoft Academic Search API. Eli White is a research software-development engineer for Microsoft’s Applied Sciences Group, focusing on personal and home automation. He attends the University of Washington and is working toward a degree in Computer Science. Before joining his current group, White worked on Microsoft’s ASP.NET team, developing Razor and ASP.NET webpages. White enjoys developing software that interacts with hardware devices for novel purposes. Steve White’s current role as partner architect in the Microsoft Health Solutions Group focuses on challenges posed by the management, analysis, and visualization of “big data,” such as medical imagery. In his 14 years at Microsoft he has also been architect of the imaging engines that are used in Windows and Microsoft Office, as well as architect and chief technology officer of MSNBC.com in its launch phase. Prior to joining Microsoft, Steve was director of Technology at Corbis, Bill Gates’ online image archive, director of the Visual Exploitation Technologies Group at TASC leading research into satellite interpretation algorithms, and founder and CEO of Technical Arts, a pioneer in high precision imaging systems for research and manufacturing. He received his Ph.D. from MIT’s EECS department investigating a novel model of visual cortical processing called Displacement Representations. Daniel Wigdor is an assistant professor of computer science at the University of Toronto, specializing in human computer interaction. Before joining the faculty at U of T, he served in nearly a dozen different roles while working at Microsoft, including as a researcher at Microsoft Research, as the user experience architect of Microsoft Surface, and as a cross-company expert on the creation of user interfaces for next-generation hardware. He also simultaneously served as an affiliate assistant professor in both the Department of Computer Science & Engineering and the Information School at the University of Washington. Daniel has previously conducted research at Mitsubishi Electric Research Labs, as well as at the Initiative in Innovative Computing at Harvard University. He is co-founder of Iota Wireless, a startup that is dedicated to the development of next-generation user interfaces for mobile devices. Daniel’s work has been published in dozens of research papers, books, and patents, including the popular title. Brave NUI World: Designing Natural User Interfaces for Touch and Gesture. Andrew D. Wilson is a senior researcher at Microsoft Research. His work is focused on applying sensing techniques to enable new styles of human-computer interaction. Today, that means multitouch and gesture-based interfaces, display technologies, depth cameras, and so-called “natural” interfaces. In 2002, he helped found the Surface Computing group at Microsoft. Before joining Microsoft, he obtained his Bachelor of Arts degree at Cornell University and his Master of Science and Ph.D. degrees at the Massachusetts Institute of Technology Media Lab. Curtis Wong is a principal researcher in the eScience group at Microsoft Research and an adjunct professor at Trinity College, Dublin. He joined Microsoft in the Next Media Research group where he focused on interaction, media, and visualization technologies. Curtis is the co-creator of WorldWideTelescope.org, a critically acclaimed interactive learning environment that is used by millions of children around the world to explore and understand the Universe. He conceived Project Tuva, an interactive exploration of the lectures of physicist Richard Feynman. His collaboration with PBS won a British Academy Award-Online Learning in 2002. Previously, Curtis was a director of the Content group at Intel Corporation, general manager at Corbis Productions, and producer for the Voyager Company, where he created Multimedia Beethoven—the first multimedia CD-ROM for Windows. Curtis serves on the board of the Seattle Art Museum and PBS Kids, as advisor to the Barnes Foundation, and served on the board of the Rhode Island School of Design. Yan Xu is a senior research program manager in the Earth, Energy, and Environment group of Microsoft Research Connections. Her research is focused on interdisciplinary computing to engage Microsoft technologies with sciences in the Earth, energy, and environmental research areas. Yan has also been driving the Transform Science effort, which aims at bridging the gaps between scientific research and science education. She joined Microsoft Research in March 2006. Prior to working at Microsoft Research, Yan was a senior software architect and worked for several startup software companies for more than 10 years. Yan received her Ph.D. in Physics from McGill University, Canada. Wenming Ye, a technical evangelist for Windows Azure High Performance Computing at Microsoft, pursued both undergraduate and graduate study at the Center for LifeLong Learning and Design at the University of Colorado. After completing his graduate work, Ye joined the Center for Technology in Learning at SRI International, where he focused on the design and development of tools for wireless, handheld, and the web. Ye returned to Boulder, Colorado, as a developer on the productization team at Tech-X Corp, where he designed a multiplatform GUI and developed commercial, cross-platform, high-performance-computing software. Ye specializes in innovative, end-to-end computing scenarios on clients, phones, web UIs, clusters, and the cloud. Luke Zettlemoyer is an assistant professor in the Department of Computer Science & Engineering at the University of Washington. His current research is in the intersections of natural language processing, machine learning, and decision making under uncertainty. This work focuses on designing, building, and evaluating algorithms for recovering and making use of representations of the meaning of natural language text. He recently received his PhD from MIT and was a postdoctoral fellow at the University of Edinburgh. Xin Zou is a principal development manager in the Microsoft Research Asia Innovation Engineering Group. He works with his colleagues in technical innovation and technology transfer. He also teaches software engineering in colleges, as part of Microsoft Research’s academic collaboration. He has been working for Microsoft since 1997; he was a member of the development team for Microsoft Outlook and Visual Studio, before he joined Microsoft Research Asia in 2005. He has a B.S. degree from Peking University (1991) and an M.S. degree from Wayne State University (1996), both in Computer Science. Michael Zyskowski is a senior program manager in the Microsoft Research Connections group, productizing state-of-the-art research technologies for broad consumption by both academic and commercial research and development. He is currently responsible for building an open-source Bioinformatics Software Library for genomics research, and a Mobile+Cloud Software Development Kit (SDK) for students and citizen scientists. Past projects include real-time simulation of high performance vehicles in both consumer and enterprise markets, 3-D visualization, geographical information system (GIS) tools, application program interfaces, and architecture/design of software and hardware systems. Prior to Microsoft, he spent time at Boeing in stability and control, aerodynamics, and accident investigation. He holds a B.S. and M.S. in Aerospace Engineering from the University of Kansas, where he was a NASA research scholar focusing on design and certification of experimental composite aircraft.